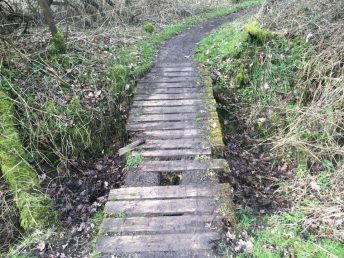 If you ride the trail regularly you should have spotted that the raised woodwork section within the triangle section has had to be closed due to instability of the supporting wooden frame. 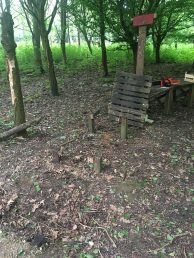 For those of you not part of our Facebook group you will not have seen the photos and discussion about the extent of the deterioration of the wood used to build the structure. 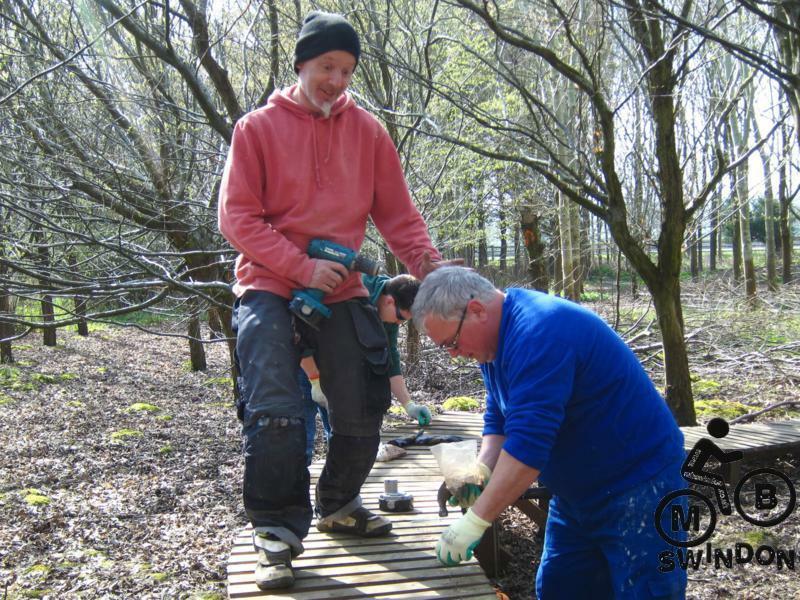 If you go down to the woods today… don’t use the woodwork section! As you can see, there is a pretty big broken section, making it unusable. 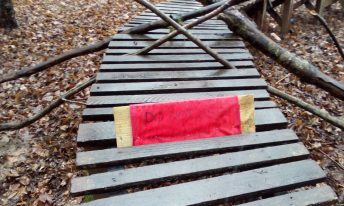 I have nailed a sign to the start of the raised section and blocked off the entrance with logs. If you go down there and see that anyone has removed these, please let one of the committee know. 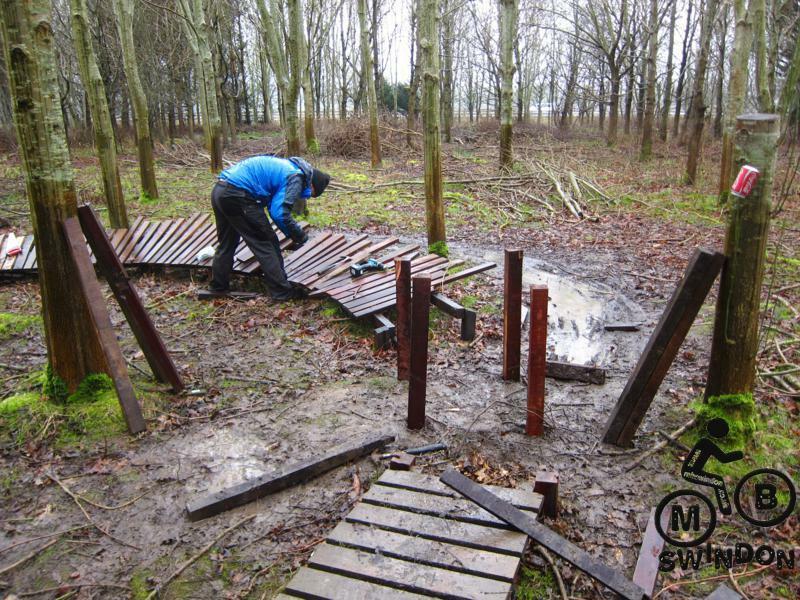 The majority of this was repaired by Jason and Pete on a wet 21 January, with it reopening the following week. Tomorrow Morning (Saturday 17th March.) 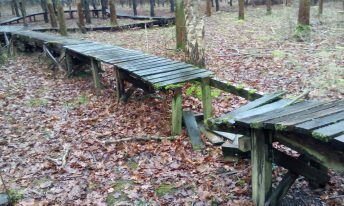 I will be doing some work to repair and replace sections of one of the bridges at Croft. It’s in a poor state and close to failure. Please take heed of any diversion notices you see – once I start work the bridge will be impassable for a time. Hopefully I will be done by 11 and normal service will be resumed. Saw this at the start of the wooden pump track. Don’t know if you guys were aware of it? Sad day I am afraid, after several reports of broken sections and a couple of inspections I have had no choice but to close the triangle woodwork section. Parts of it are now very rotten and some parts have actually broken. I have cut away the entry ramp, but please don’t attempt to ride any part of it. Discussions are underway with several people/groups to decide the future of this feature. As can be seen from this post on the day of the demo day, the amount of repairs required were too great to do in a couple of hours so the decision was made to close it indefinitely while a plan was made of how best to repair and replace. Just an FYI, I’m going down to the Croft trail in a few mins to do a walk of it and take some notes down of any issues. Want to get a list of problems so that we can start to work through them in a planned way on each maintenance day. Just in case anyone comes across me and wonders what on earth I’m doing with a clipboard and pen! 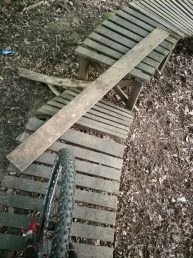 Just so everyone is aware, people have been making their own bodge repairs to the woodwork section and then riding it in reverse. All the signs and blocks that were in place are nowhere to be seen. 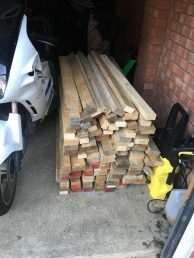 Across a couple of posts, I have seen people asking why their offers of help and support to repair/replace the woodwork have not been taken up. 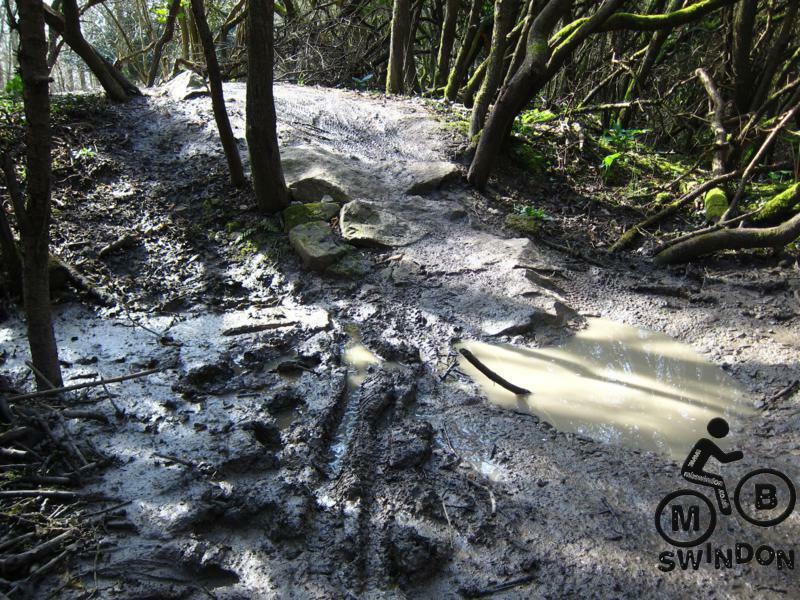 Whilst we try to run the club and maintenance of the trail in as simplistic a way as possible unfortunately sometimes things take time to happen. In this instance there are various reasons why there doesn’t appear to be much progress. 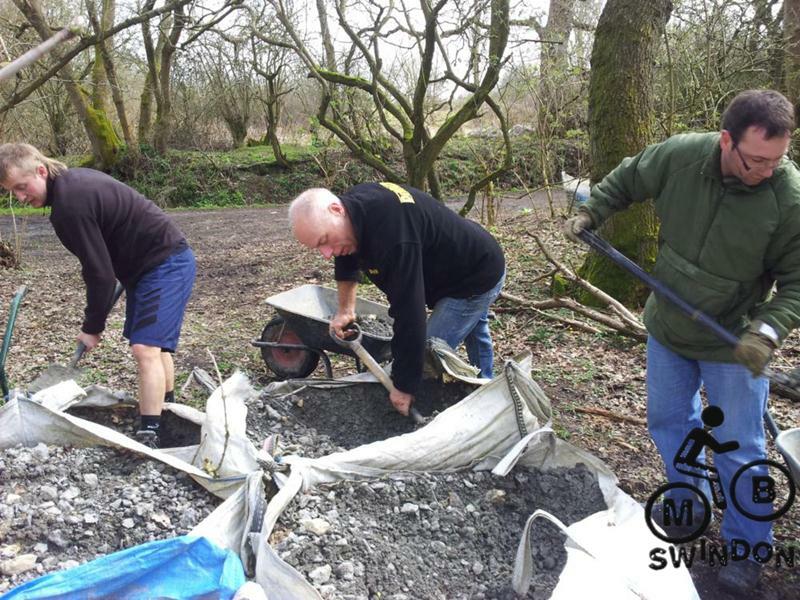 Firstly we are all volunteers that have demanding day jobs, secondly we have personal lives that also take priority over the club and thirdly the maintenance tasks need to be planned out and prioritised. These plans have been started and some of the materials required have been purchased. Those people that have been in touch offering their time and skills have been noted and once we have a more defined plan we will be in touch. 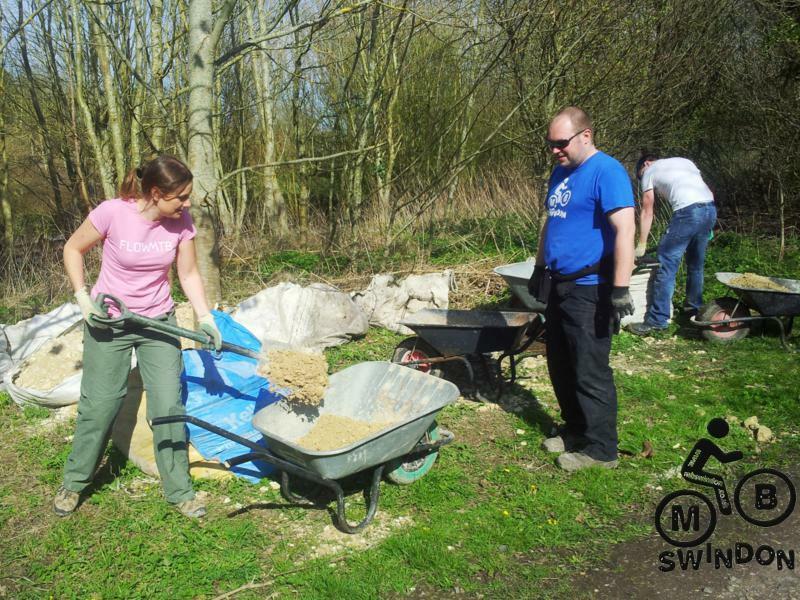 We will then advertise the build days so that all who want to help will know when they are happening. This was a low key trail build day. 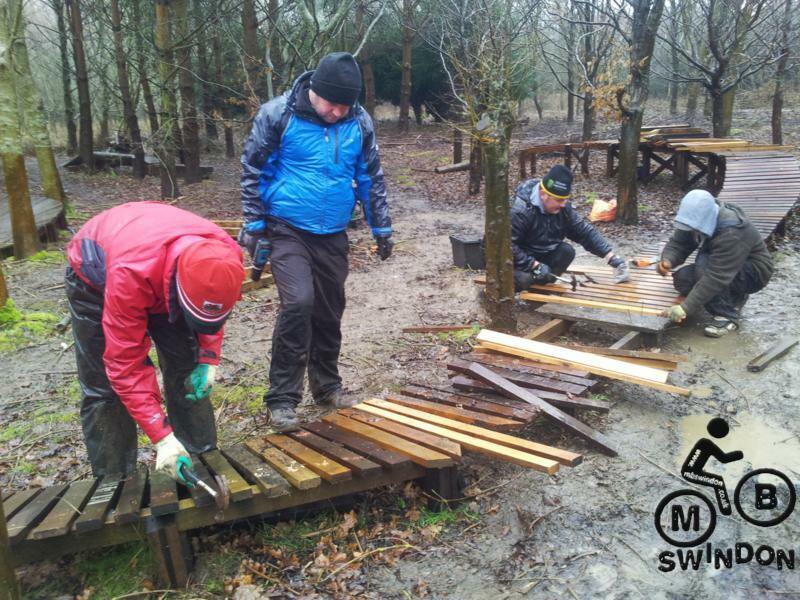 On the February build day we’d shifted 20 tonnes in record time and ended up with stock piles of material in strategic locations round the trail. The plan for the day was to finish and open the wood section in the triangle. This had been almost finished back in January. Jez, Ricky and Gary (Gary 5) got straight on with wood task. 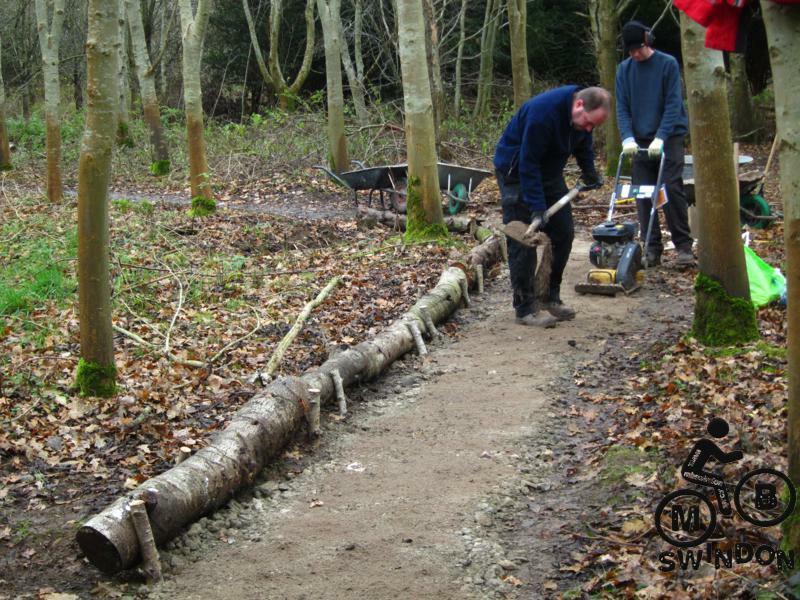 Meanwhile Phil, Tom, Pawel and Sarah marked out the entrance path, dug it out and then filled it with limestone. 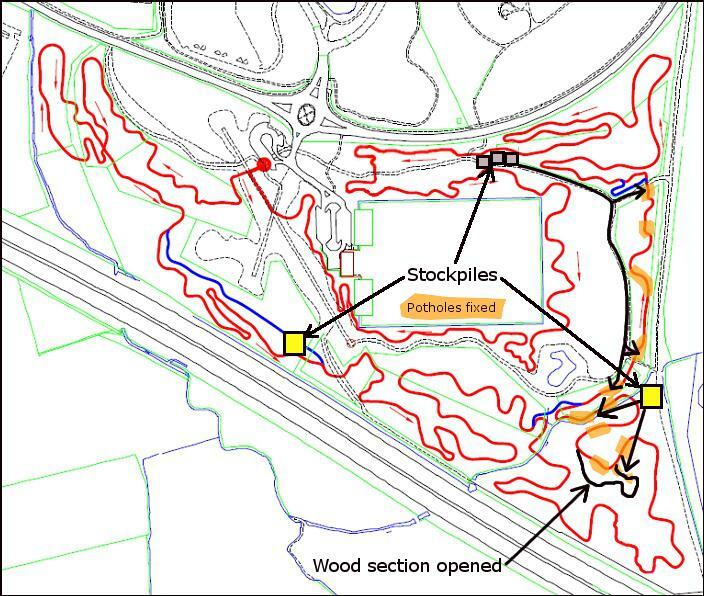 The short section off the end of the first logs to the start of the extended raised section was also filled in. Chris came along with a broken gas stove and then Kate arrived to help too. 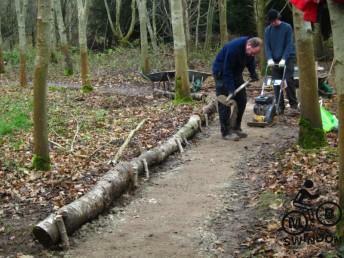 With the wood section officially opened then a lot of OCD pothole filling was done in the area. Some serious water damage was discovered in the back alley and it was necessary to shift material from a more remote gravel stockpile to fill this. The distance was around 300m and three people did about 6 journeys each. That means they walked 1.8km pushing a wheel barrow. Good training for something. The Garmin log from the build day shows 7.5km total distance walked. New section opened. Raised beds for the flowers too. After months of rain and cold it was pleasant to be out on an early spring morning. Small patches of green were appearing on trees and the birds were tweeting (they haven’t mastered hashtags yet though). Pothole filling kept the group occupied for most of the afternoon. 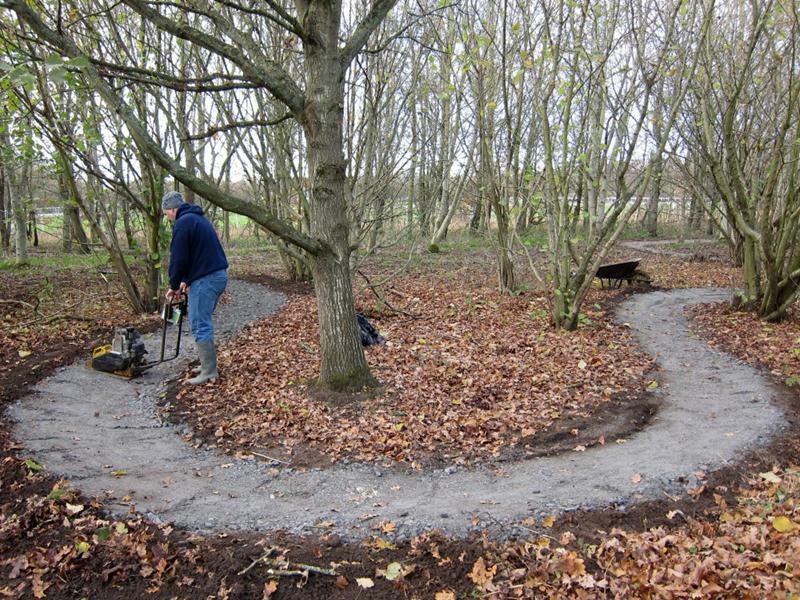 It was very satisfying to see a damaged patch of trail be turned back into something robust. 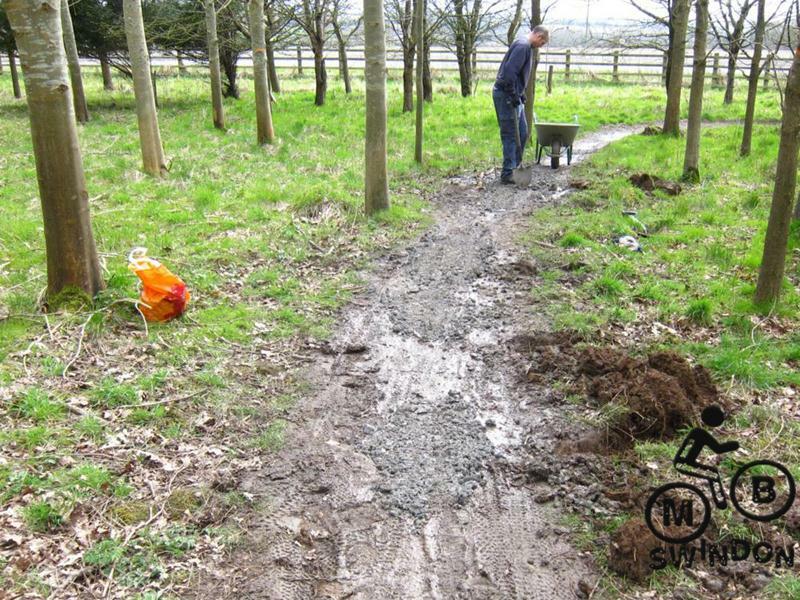 In general we’ve been very pleased with how well the trail has stood up to a very wet winter. 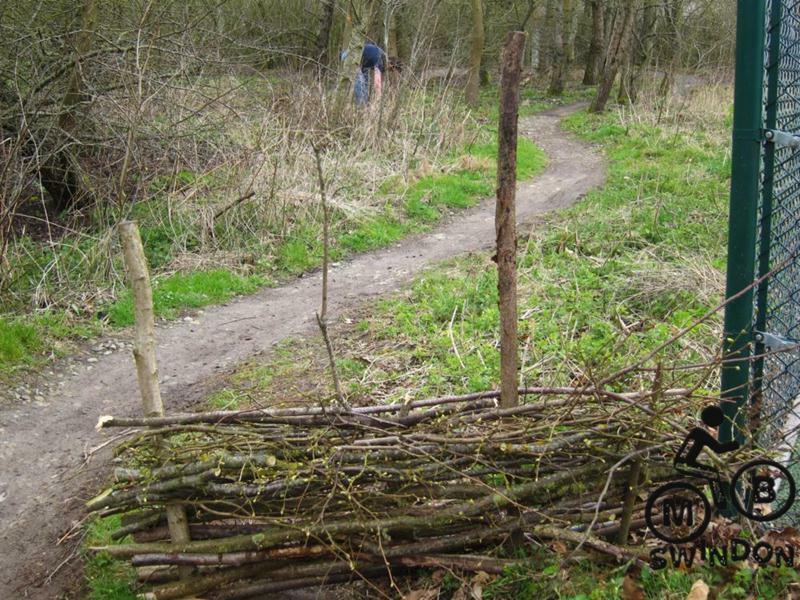 Thanks to everyone who came along and helped keep the trail in good shape. Future build days will be advertised on the events calendar. The original triangle was closed in late 2010 (see the plans from August 2010). 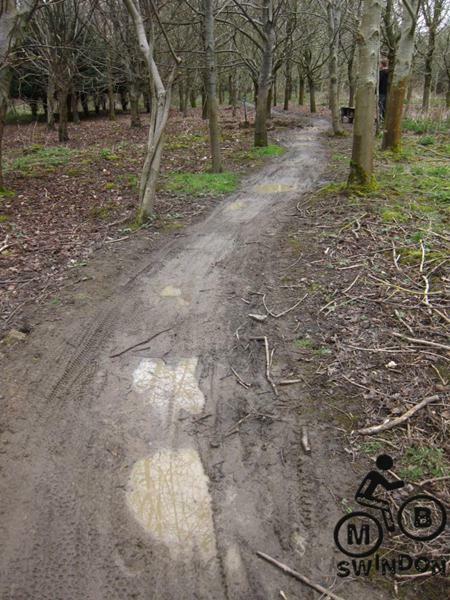 The first attempt at marking a simplified route was done in Sept 2010. The bulk of the work was done during 2011. It carried on into 2012 with it opened ready for the April open day. 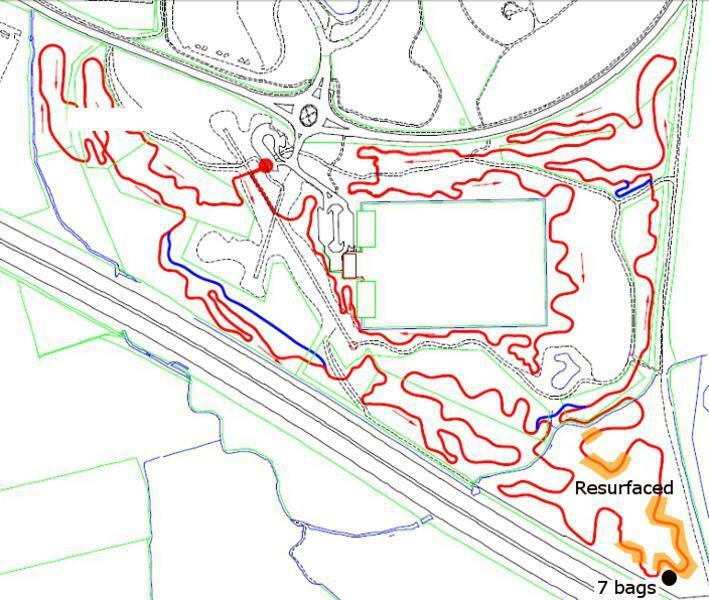 The entrance and exit lines had been scouted in May 2010. The entrance link was marked out in Aug 2010. The logs were moved in Nov 2010. 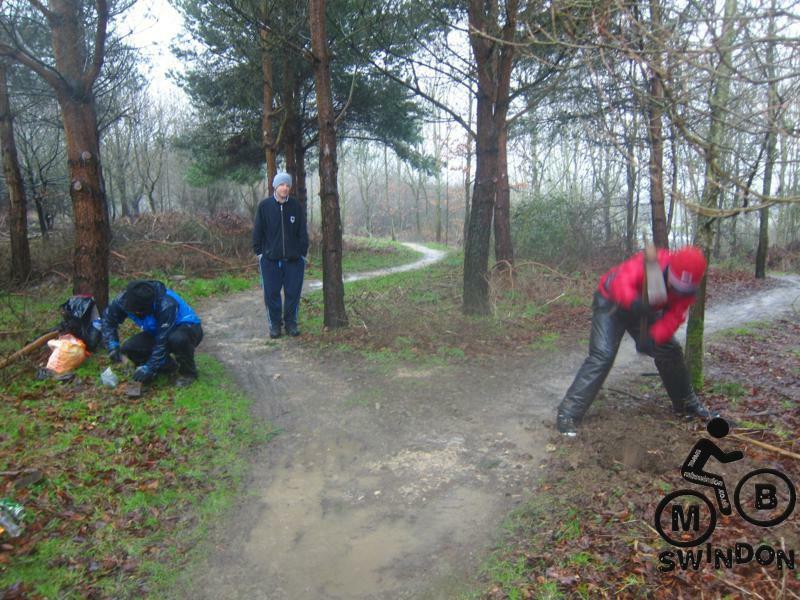 The triangle entrance was cleared in 18th and 28th of Dec 2010. The 2011 build history covers the triangle activity. 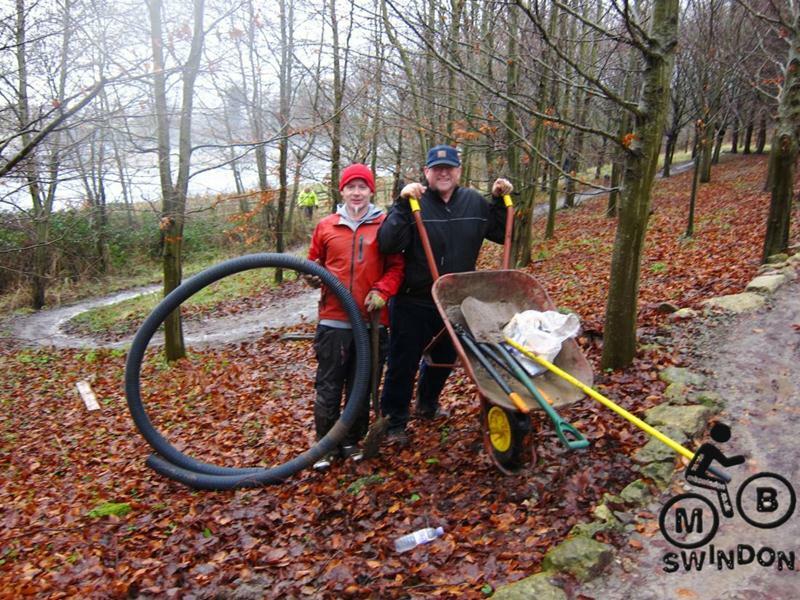 The 2012 work consisted of more surfacing on the 14th and 15th of Jan. More material was moved on the 4th ready for the 5th of Feb. 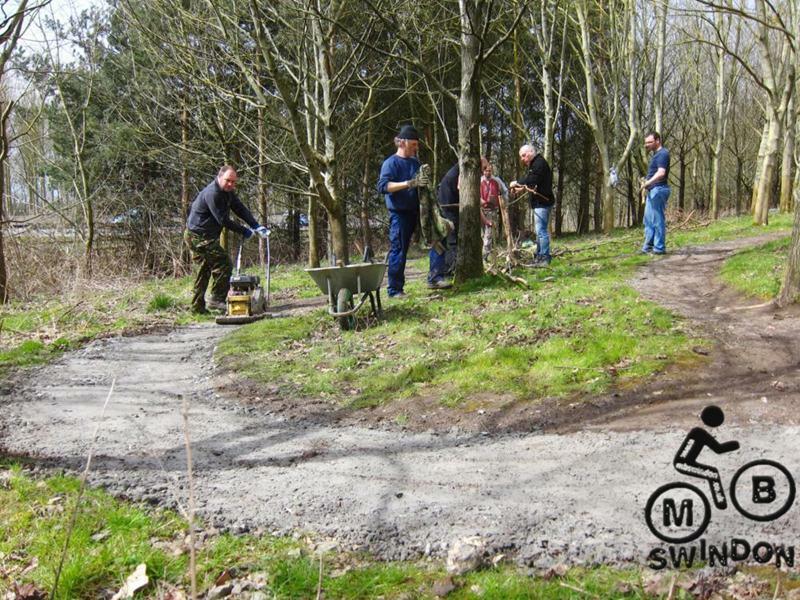 The final connecting berm was built on the 4th March and a few minor details finished on the 24th March. Resurfacing work was done on the 8th and 9th of Sept 2012, drainage work in Dec 2012 and pothole fixing in April 2013 and Dec 2013. 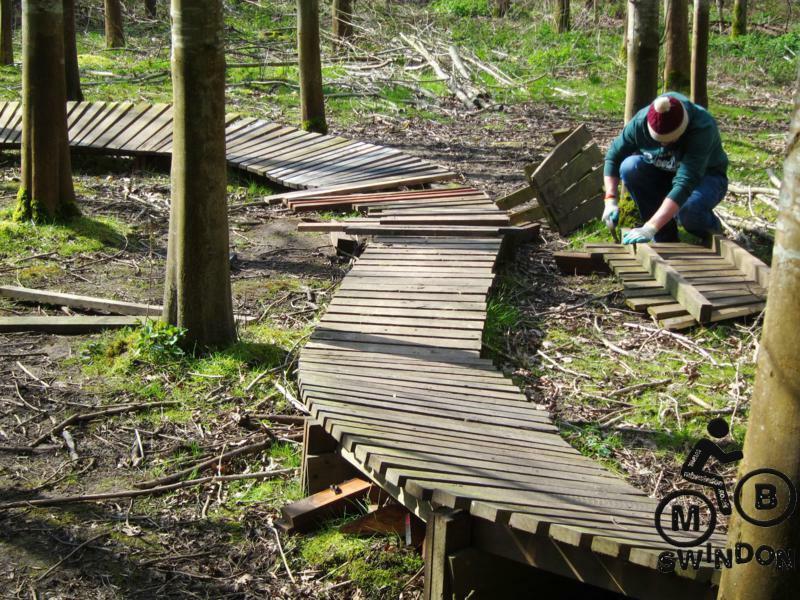 The wood section was mainly built in 2011…it’s just taken a while to finish it properly. 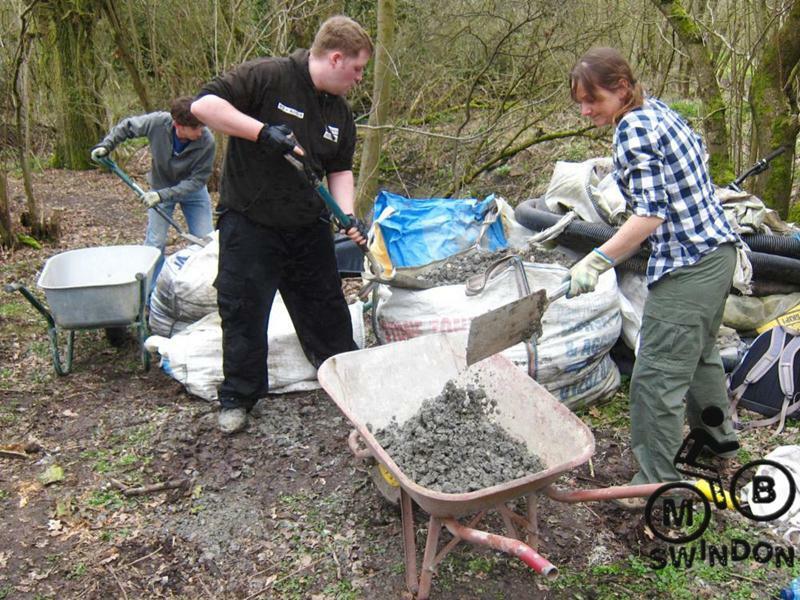 Come and help us at the February build day! I couldn’t help but notice on the drive over that there was rain falling from the sky. 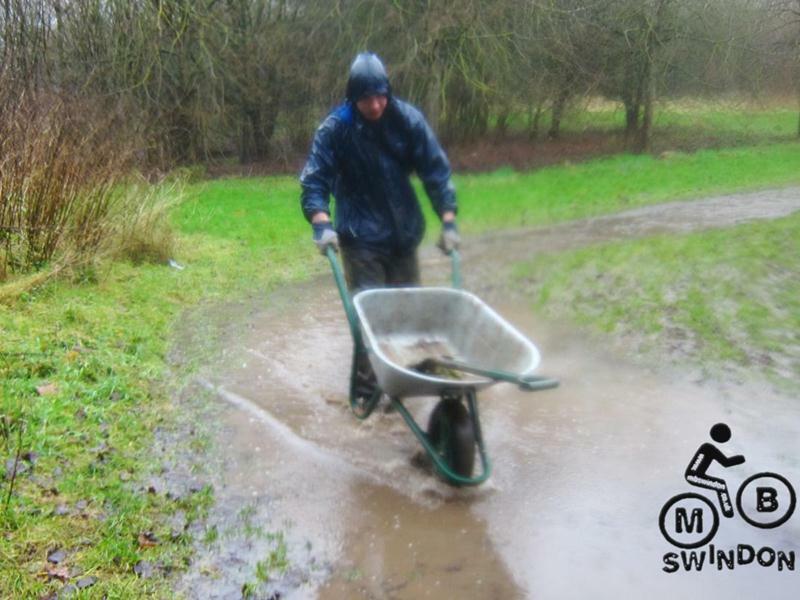 It was clearly collecting on the ground in big puddles. When I arrived at the trail the rain was still falling. Oh well, nothing stops a build day. 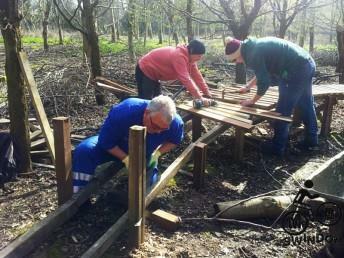 In the triangle I found Jez, Phil, Kristian and Kirk hard at work finishing off sections of the raised woodwork. The weather gave the ideal ground conditions for banging the large stakes in. That’s about the only positive regarding the weather. We made good progress and connected several sections. After a few hours we’d used up all of the slats and flattened several batteries. We were also wet and cold so quite happy to stop. 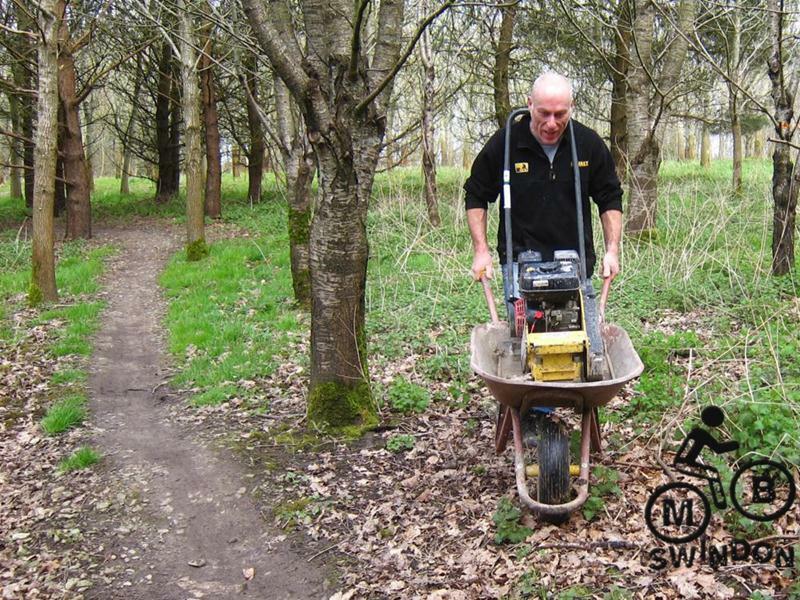 At our last big build day we’d lost one of our mattocks. After much searching we decided to record it as missing in action. 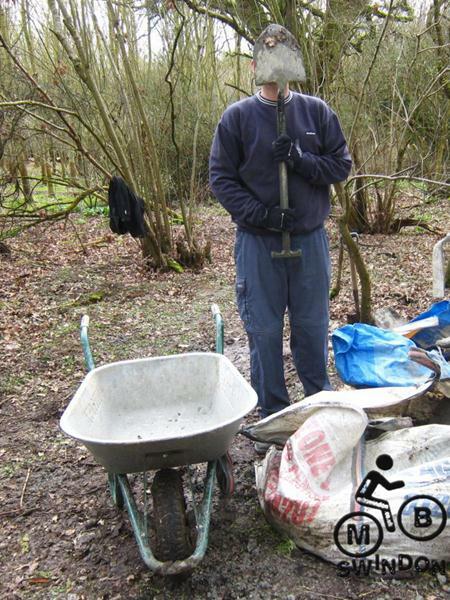 A few days before this build day a rider posted on our Facebook wall to say that they’d found a mattock. They moved it to a special secret location. We sent Mike Jeffries off to collect it. He was gone for a long time but eventually returned with the trophy. It took a bit longer than expected because he fell over in the mud. After a few weeks of rain the river was almost touching the bottom of the bridge in the triangle. I took a quick trip over to the east side of the pitch to take a look at the flooding and found our canal was working well. 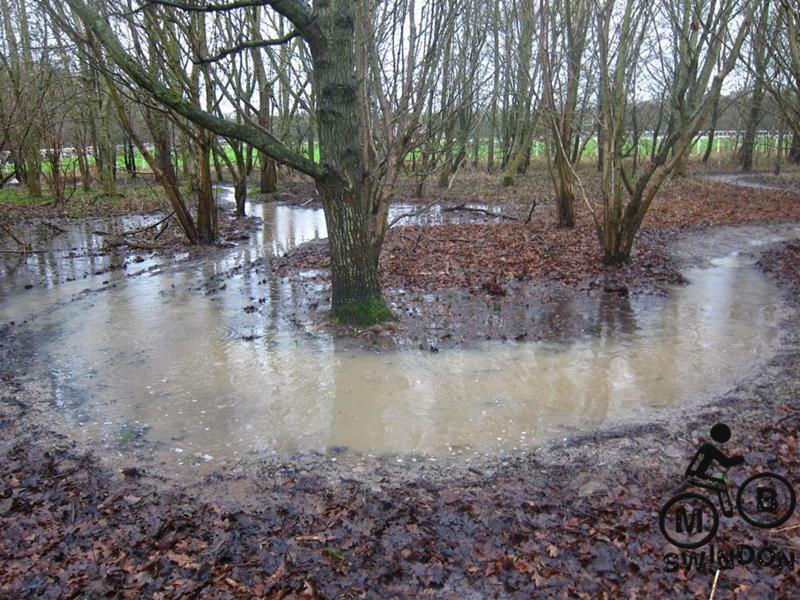 We dug this in December 2012 and January 2013 after a big flood over Christmas. 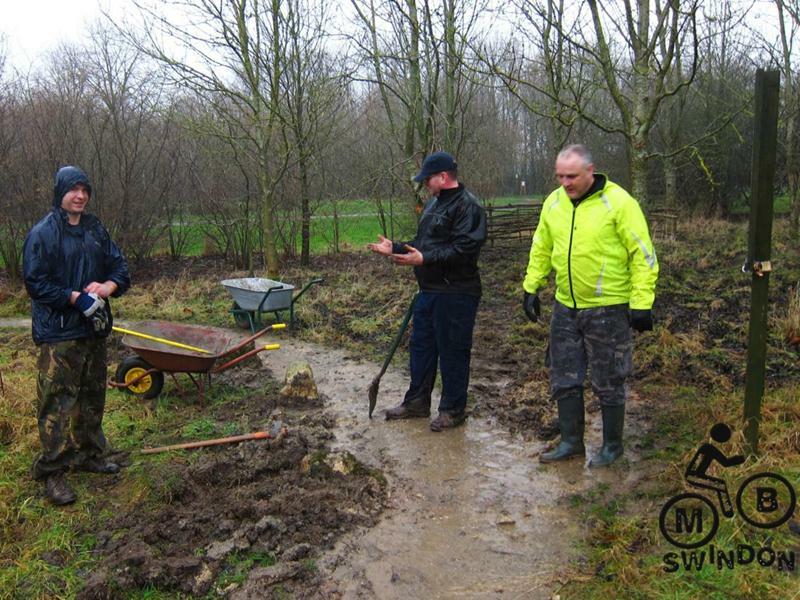 We fixed the flooded section in March 2013. Our final job of the day was to concrete in a sign post that had been ripped out of the ground a few times. Generally posts that are ripped out will be somewhere nearby. We’d spent a long time searching for it on a previous build day and given up. We decided to have a final look for it. The four of us set off in different directions and wandered around for ten minutes. 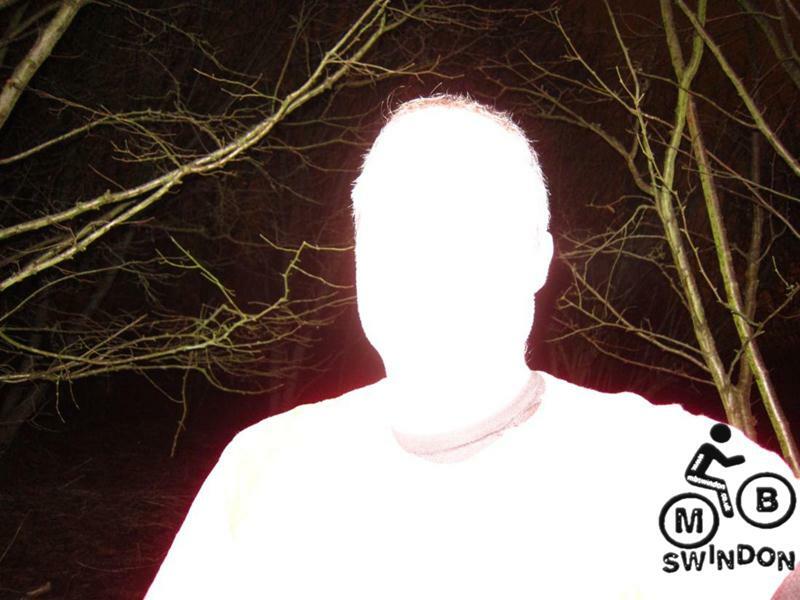 Then I heard a shout and Phil arrived with the missing sign. Good job. 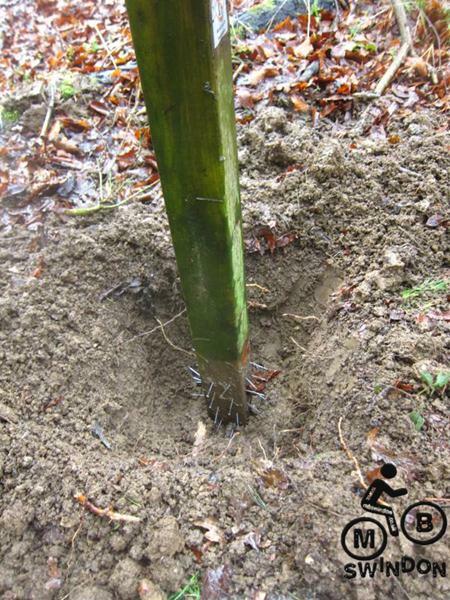 He hammered at least 6 nails into each of four sides of the post before we postcreted* it into the ground. You do the math(s) on how many nails that is. *the week after my holiday in the Mediterranean was known as postcrete. With that done we went home to dry off and warm up. 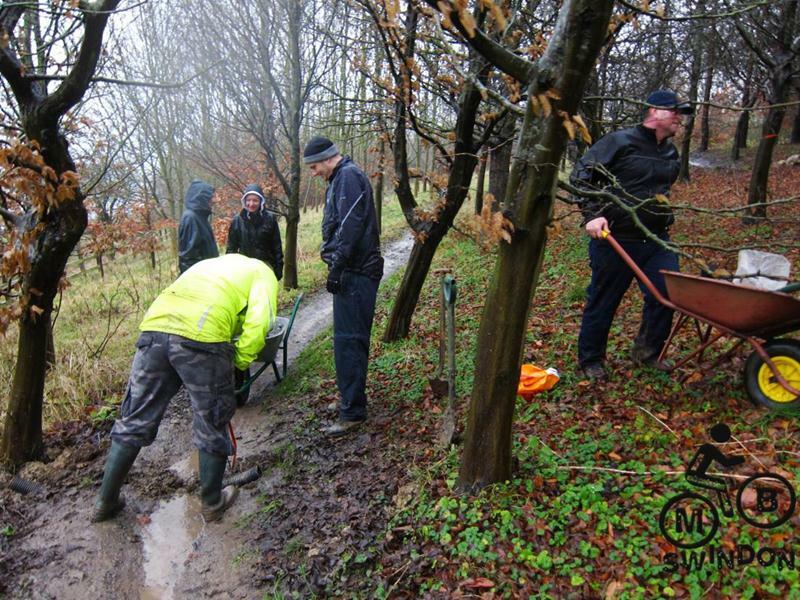 Thanks to everyone who was there working in the rain. 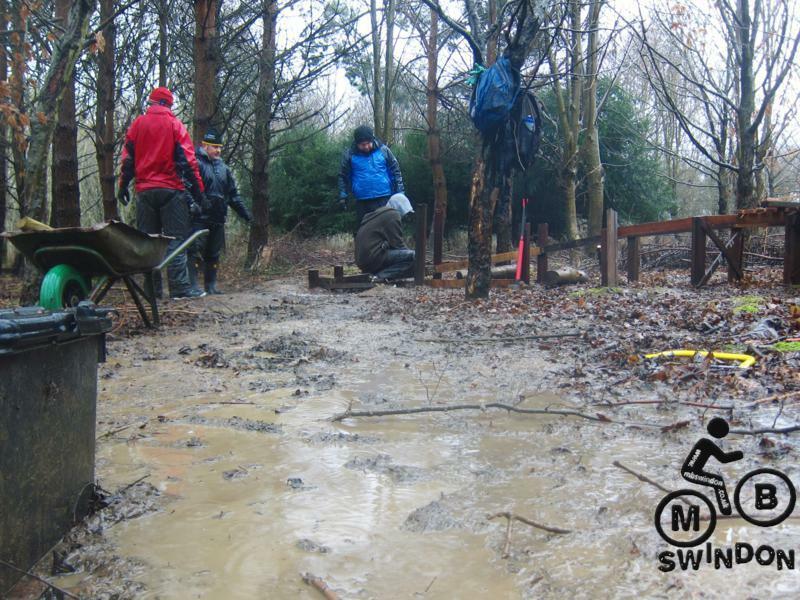 The experts on Facebook voted our Mudtrek build day as being colder and wetter. 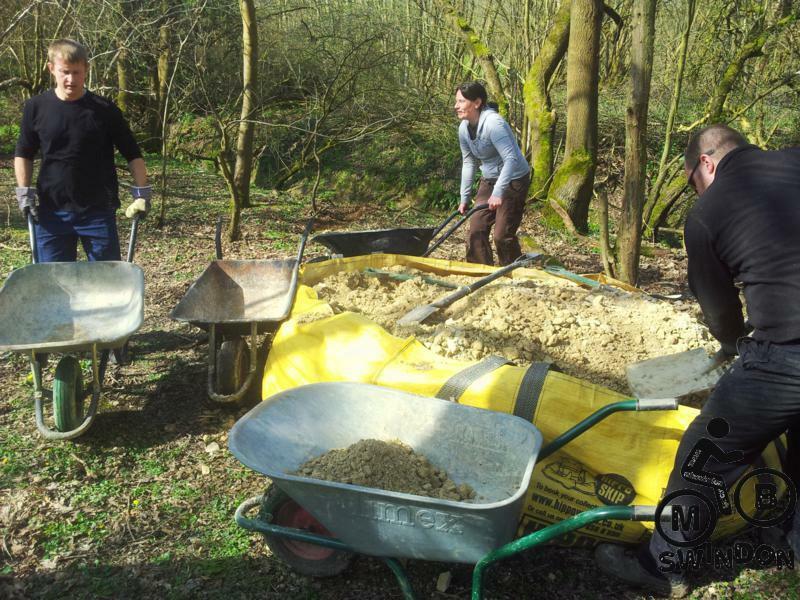 We’re going for a big push at the February build day! (More info about the big push). This was our last build day of the year. 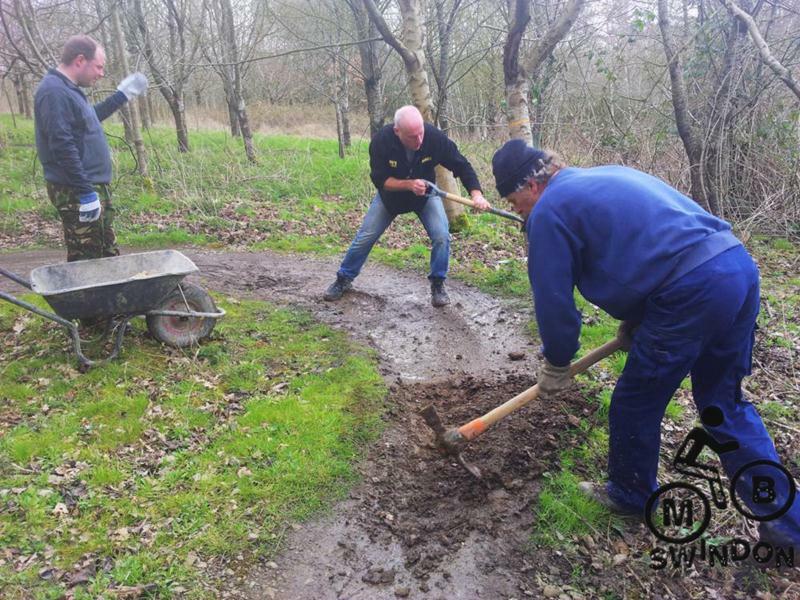 The plan was to fix and resurface a few muddy patches in the triangle using material that we’d moved on the previous build day. Phil Mayger, Kristian Price, Chris Macnamara and myself (Tom) were there from the start. 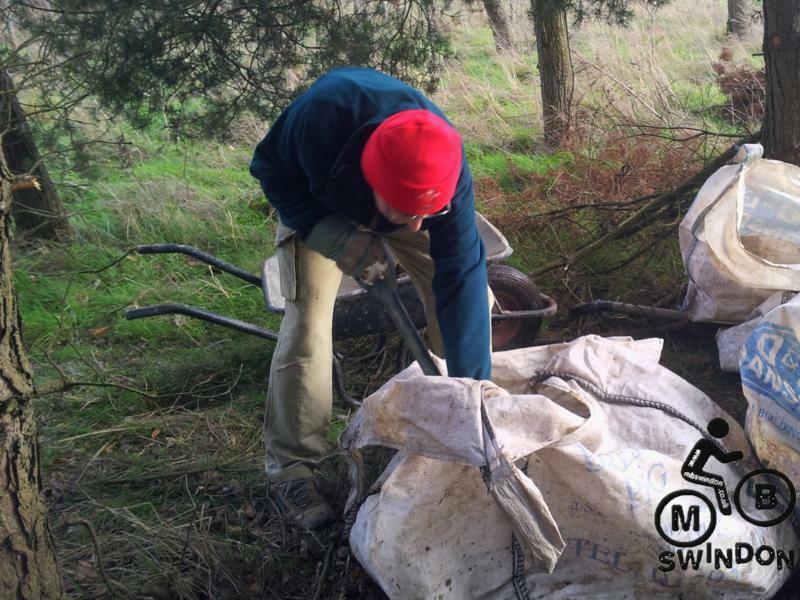 On the walk down to the triangle we found the missing stash of gravel sacks….in the river. It looked like they’d blown there in the recent high winds. That was a mystery solved anyway. We decided to start at the furthers point from the gravel stash. 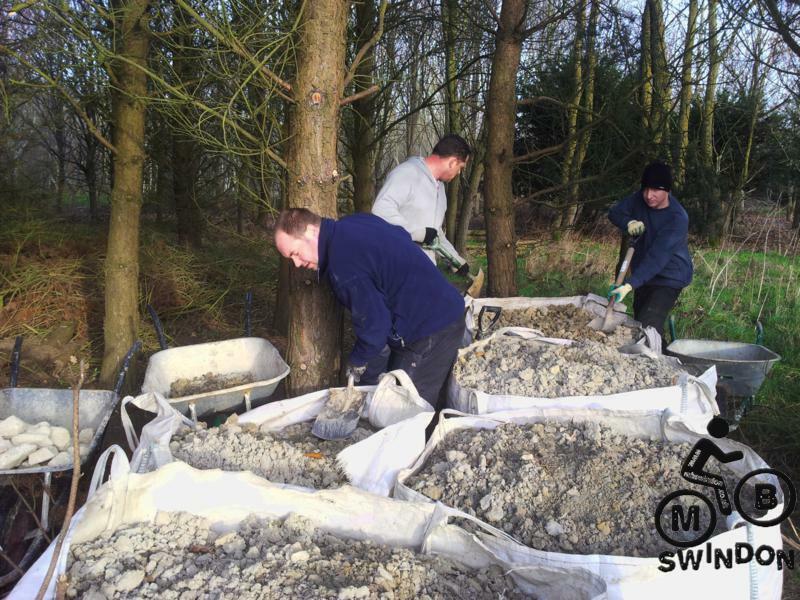 A few puddles were drained out, gabion was tipped in and then the whole lot was resurfaced and compacted. Kristian built a few bits of wooden edging too. Chris and Kristian left. Chris was replaced by another Chris (Hopkinson). After some very busy build days it looked like this one was going to be quiet. Not to worry. We were making good progress. Reinforcements turned up in the afternoon: Steffan James, Paul Kidd and Richard Ford. 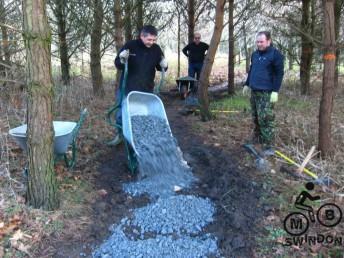 By about 3pm we’d moved all of the available gravel. It was soon dusted and compacted. Finally some drainage channels were dug and then we called it a day. Great work. Thank you everyone who turned up. 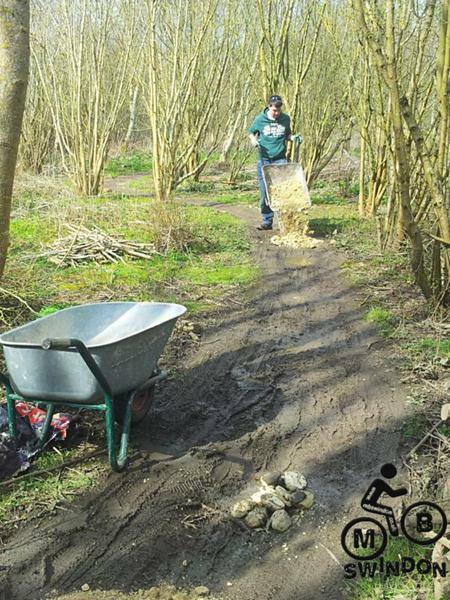 We’d already fixed some of the triangle area in April 2013. 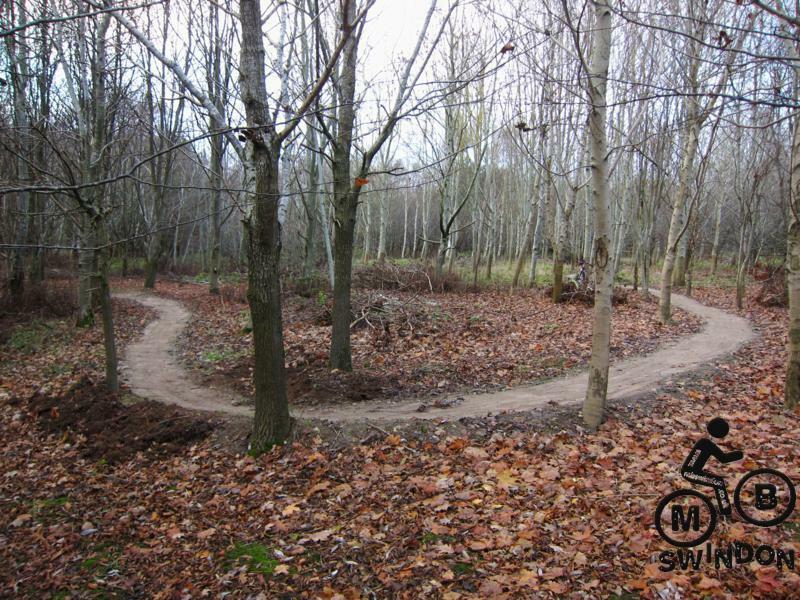 The triangle was dug out in June, July and August 2011 surfaced in September & October 2011, January 2012 and then topped up in Sept 2012 (more). Some build day turnout highlights (not based on an exhaustive study). After a bit of warm rain on Saturday it was promising to have a dry and sunny morning. Arriving just after 10am I found Stewart Mackay, Paul Kidd, Finlay Kidd and Wayne Brown ready and raring to go. 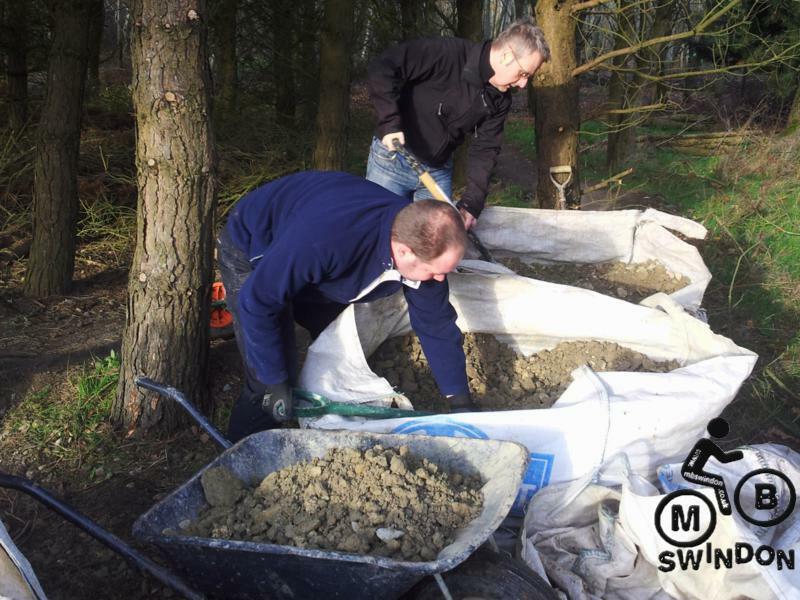 We got stuck straight into the first task for the day: fixing a load of potholes in an area we call “motorway1” and “motorway2”. 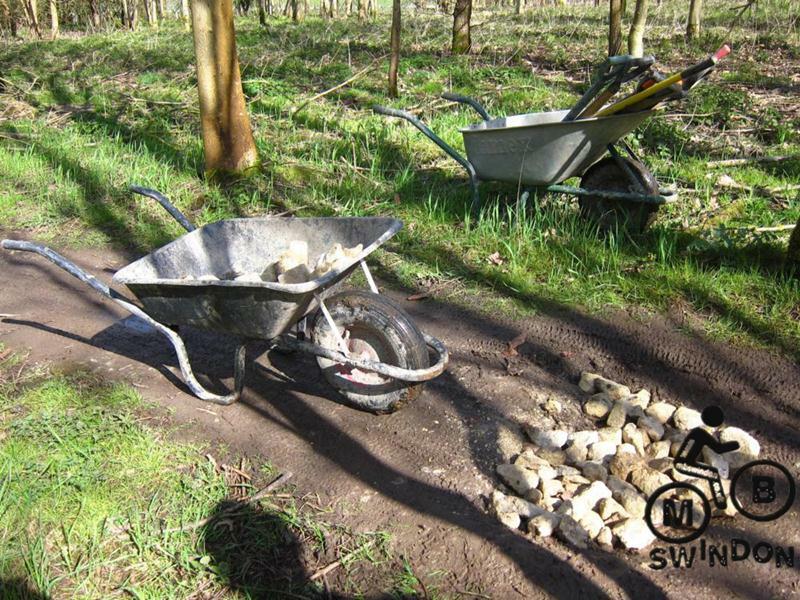 The potholes received gabion rocks and a topping of limestone before being compacted (once we had the whacker plate running). 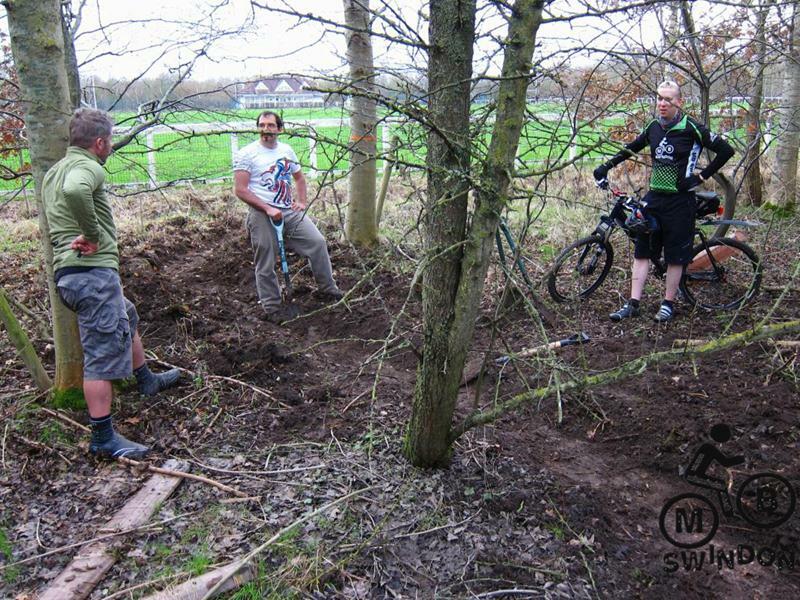 A fence was constructed to close off an annoying short cut on the bottom switchback. 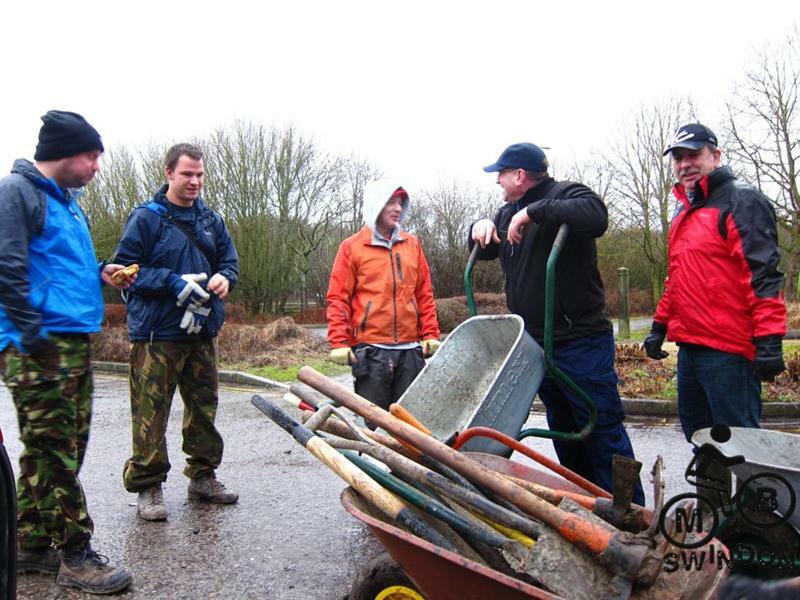 As the morning progressed we were joined by Matt Dobson, Pawel, Gary Yeates and Phil Mayger. 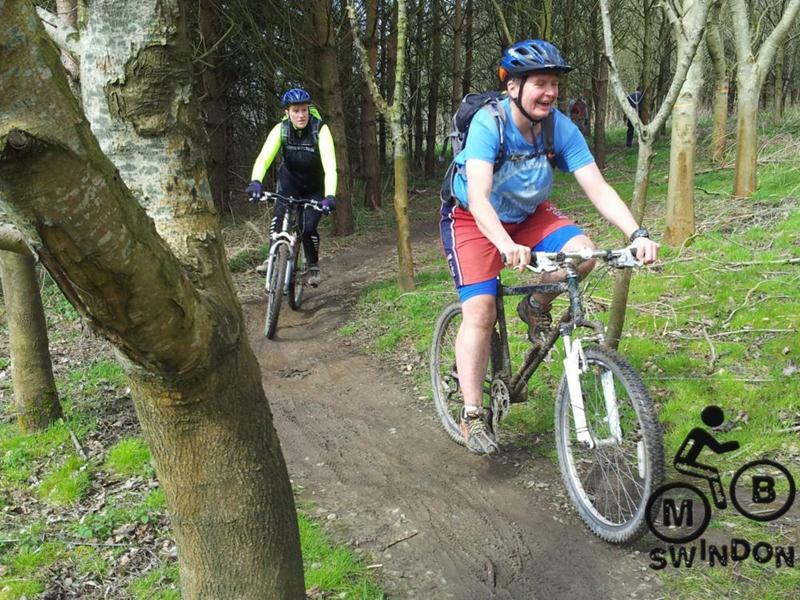 A club ladies ride was taking place at the trail so we spotted a few riders as they came past. 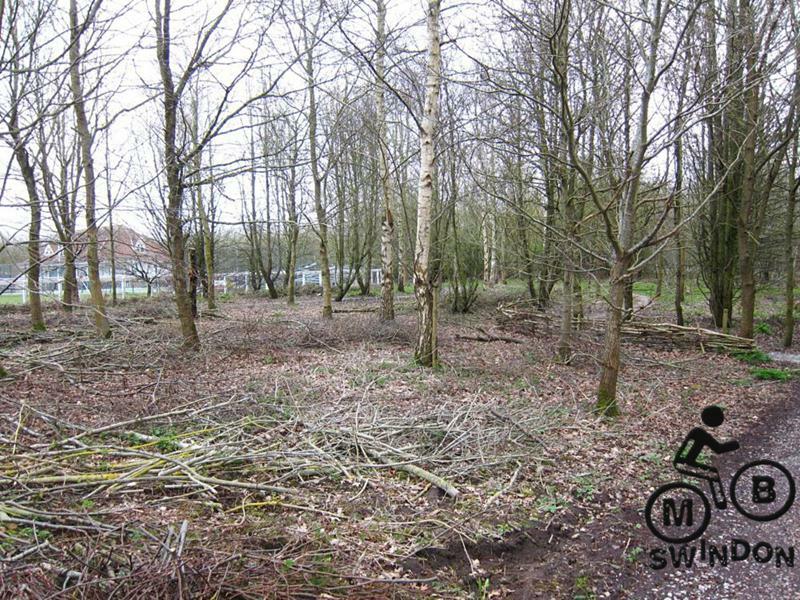 This area was first dug out on 27th Sept 2009 (not uploaded yet), first surfaced in Oct 2009 and then properly in Sept 2010. A section was rebuilt in Dec 2010 . More surfacing was done in Jan 2011 (more) and March 2011, gaps filled on 4th and 10th of March 2012 and then patched in September and December 2012. 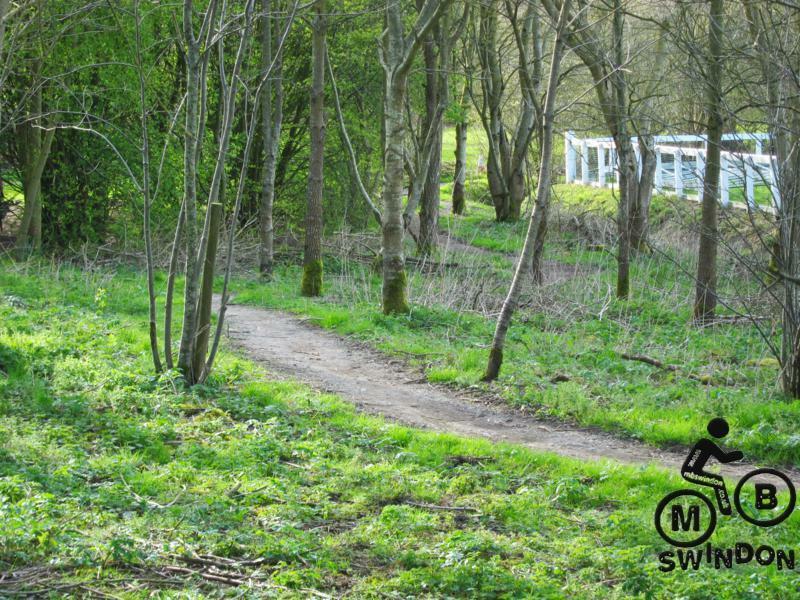 Two more short cut obstructing fences were built in the area at the end of the trail near the tennis court. 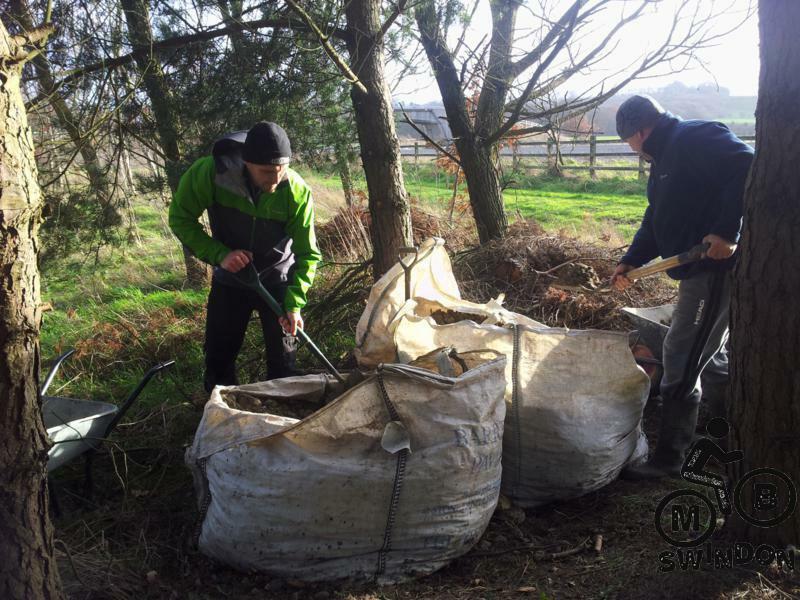 With all the material used up from the first pile we had to barrow more in from the triangle until everything was fixed to our satisfaction. With that done we moved onto a second major job of the day: fixing potholes in the alley. This was first surfaced in Oct 2010, exit mods were made in Dec 2010 and more surfacing was done in Jan 2011 plus the final link in Dec 2011. The first part was topped up in May 2012. Our first surprise visitors for the afternoon were Ben Rukin and Kate Bevan. They arrived in time for Sharon Bassingdale’s cakes. Our second surprise visitor of the day was Andy Matthews. Old time trail builder, not seen for a while. 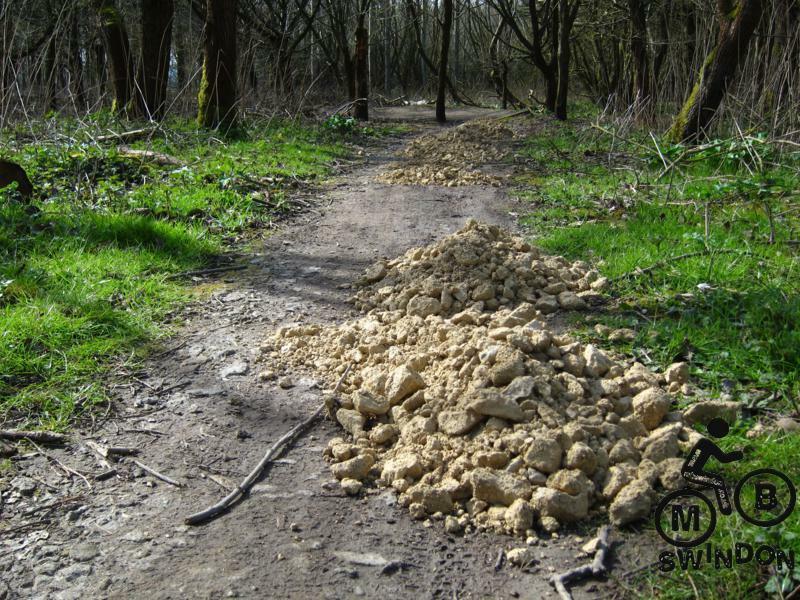 The last of the material was used to fill potholes in the triangle: a small hole after the rock feature, some bigger ones after that and the whole of the back straight. 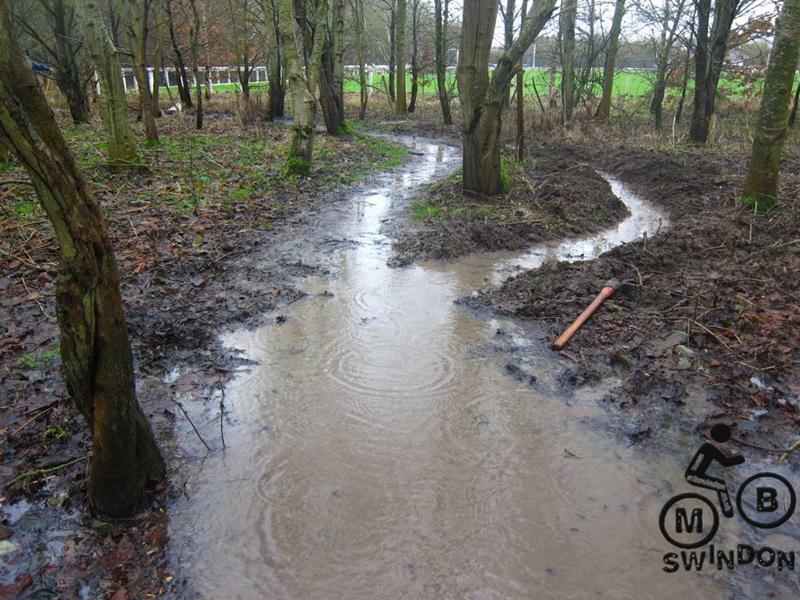 We were running very low on material by this stage and some areas only received puddle drainage. 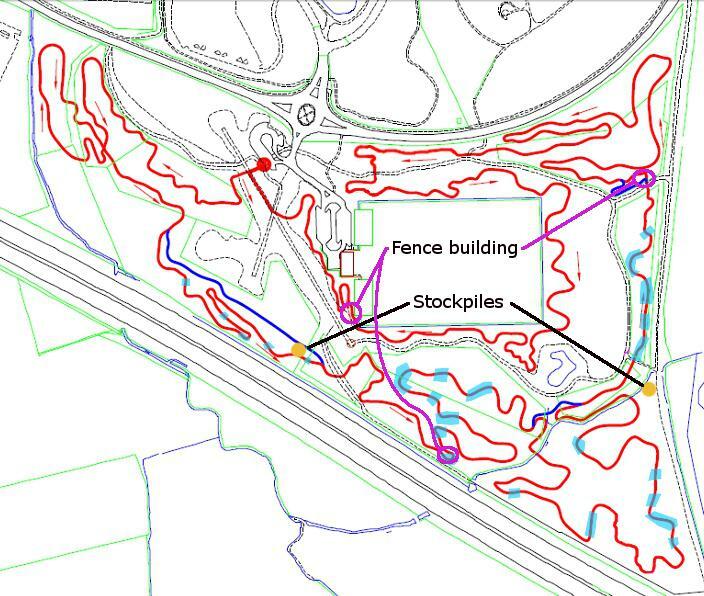 This area will be reinforced during 2013 once we’ve had some material delivered to the area. 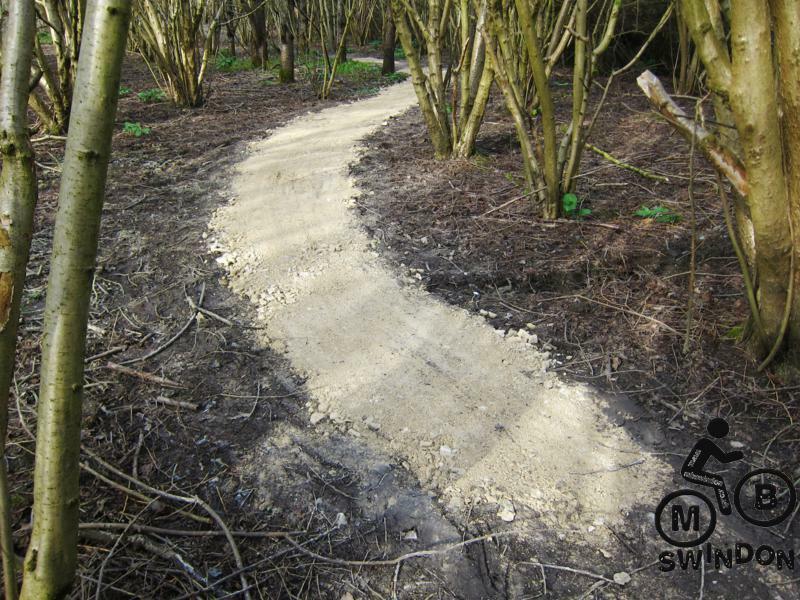 The triangle was dug out in June, July and August 2011 surfaced in September & October 2011, January 2012 and then topped up in Sept 2012 (more). The final job of the day was blocking various short cuts on Pete’s steps on Piper’s hill. 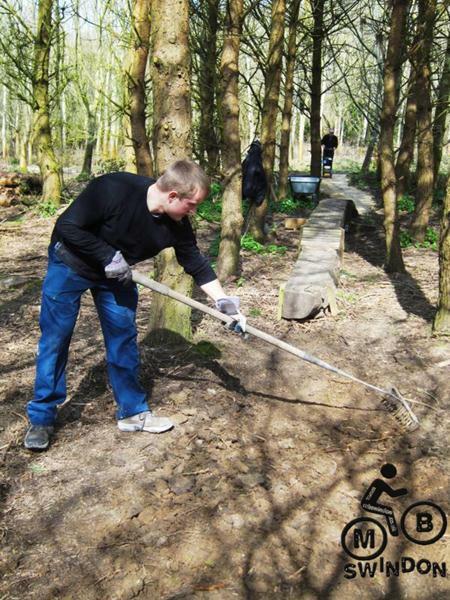 Thanks to everyone who came along and, once again, made a massive difference to the trail. 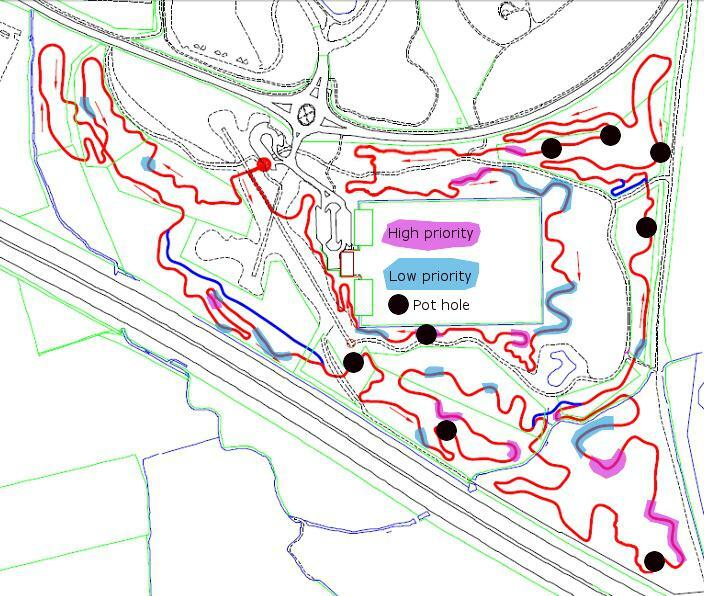 Trail build progress is shown in the map below. See the complete build diary. 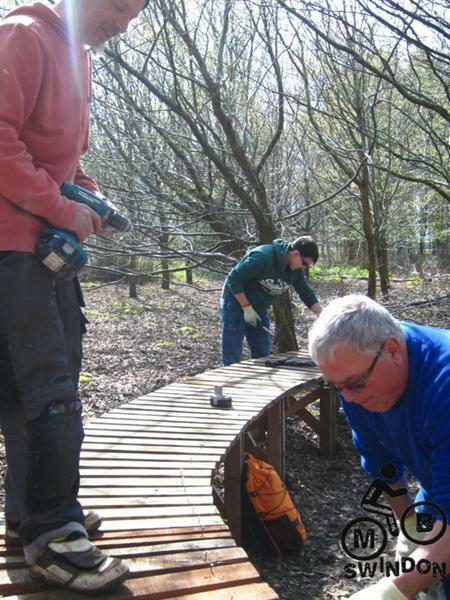 Bonus trail build session (half day). 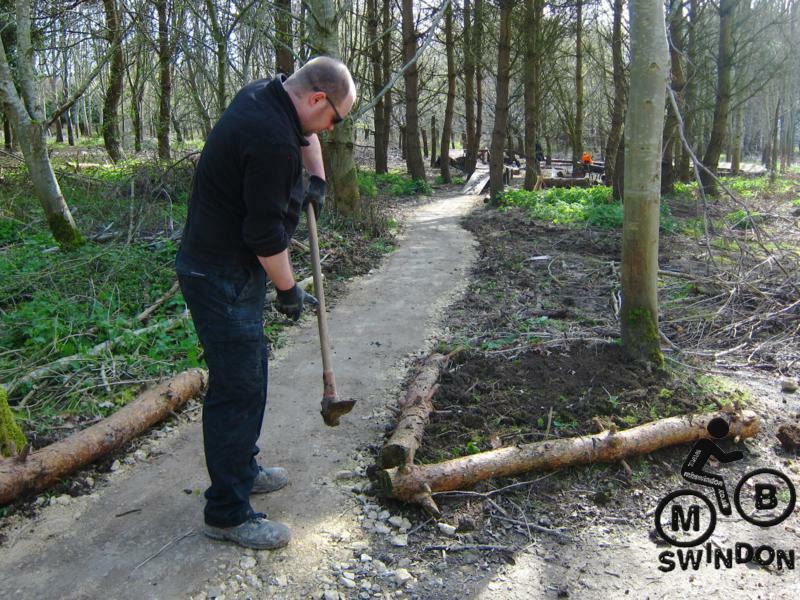 We made massive progress at the recent build days (trail patching Sat and Sun plus some drainage work 2 3). We want to meet up for a few hours and shift some material that’s ready to go in the triangle area…right where it says “stockpile” in the photo below. 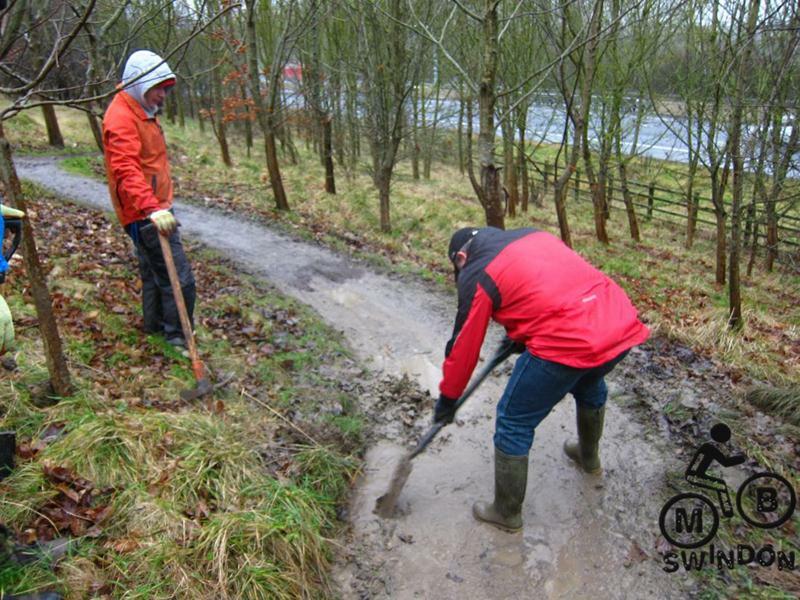 (This session is in place of the postponed Mudtrek trail build weekend). We’ll be meeting in the car park at 11am. Turn up any time you like – we’ll be in the triangle (bottom right of map below). See the complete build diary. Future events are on the events calendar. 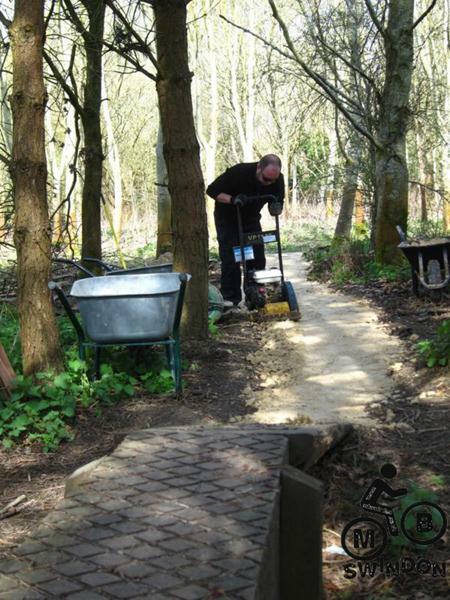 This was a follow on from our initial drainage work and the nocturnal digging session the previous evening. At 1:30pm we had Phil Mayger, Jerome Crametz and myself (Tom) ready to dig a canal. 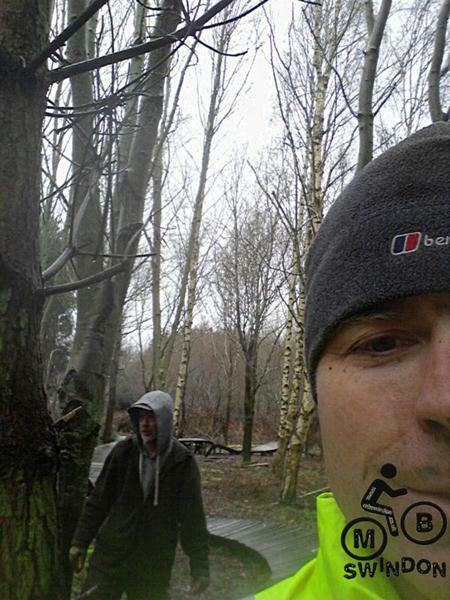 We found Chris Hopkinson wandering around the trail and he joined us. 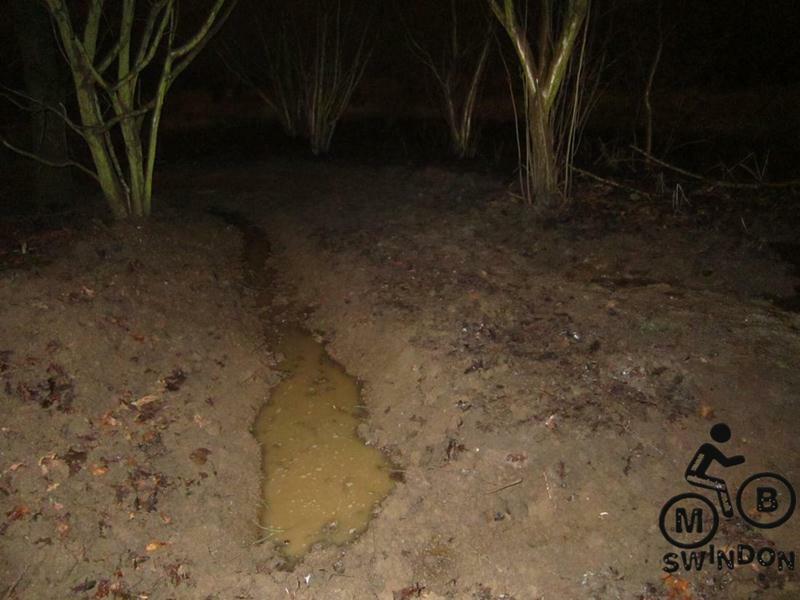 We linked the ditch that I’d dug the previous evening with the original drainage channel and made that deeper whilst we were at it. Chris went and Jez turned up in his place. 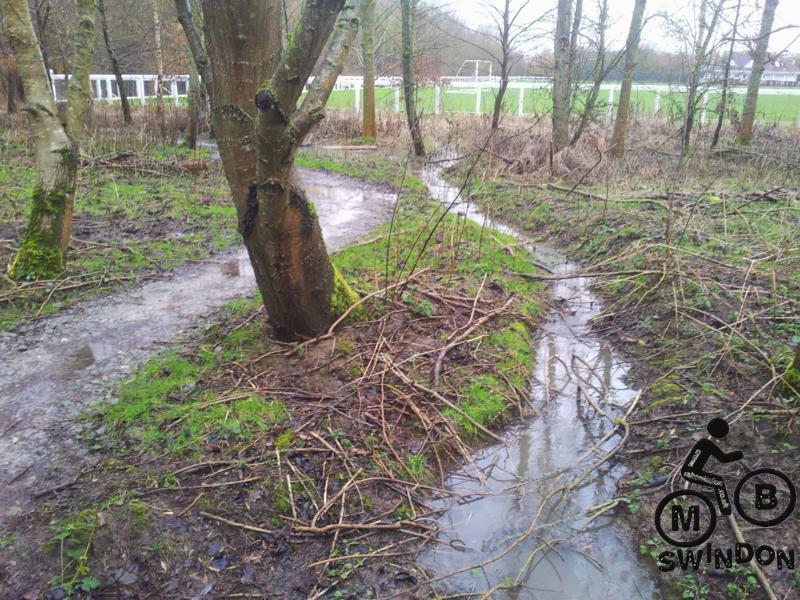 We cut a channel all the way through the nearby ditch on the edge of the sports field. Matthew Kerry called round to take a look towards the end. With that done we called into the triangle and filled a few potholes on the exit straight. This had been dug out in May 2010, Aug 2010, May 2011 and surfaced in Oct 2011 with the final bit in Jan 2012. 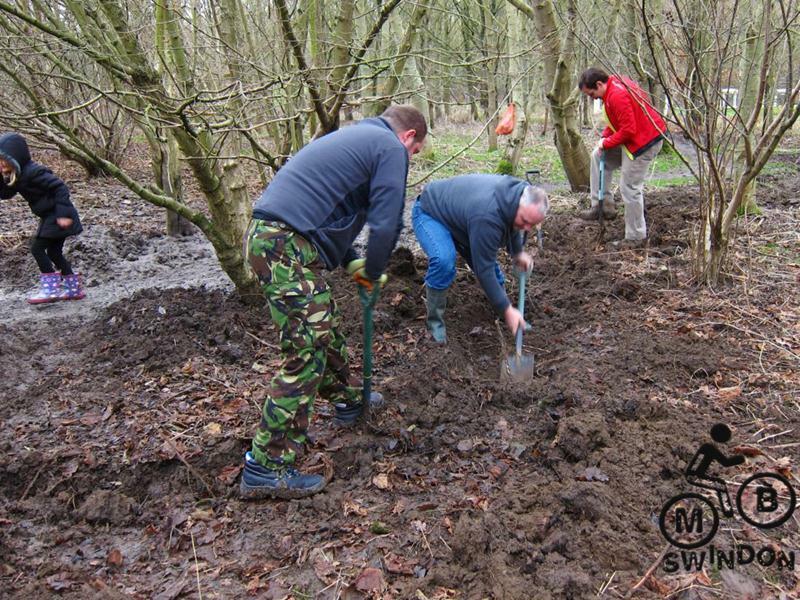 We’d made a start on draining a large puddle on the OCD (obsessive compulsive drainage) session a week earlier. This was a 2 hour digging session on my own where I drained the remaining water out of the last remaining puddle. I started at 4pm and it was dark by 5pm so I used my Exposure mountain bike light to illuminate the digging area. 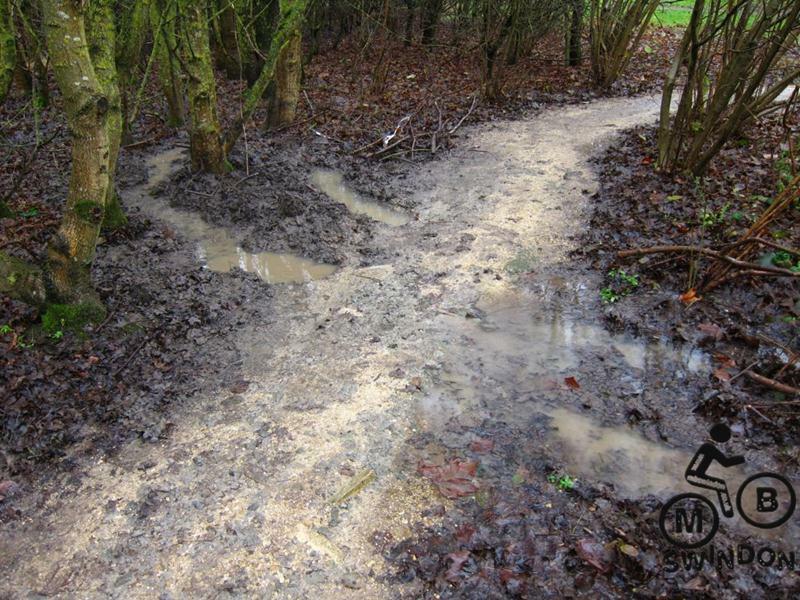 I also scraped the mud off the trail surface. The limestone layer was still rock hard underneath so we expect this area to fully recover. 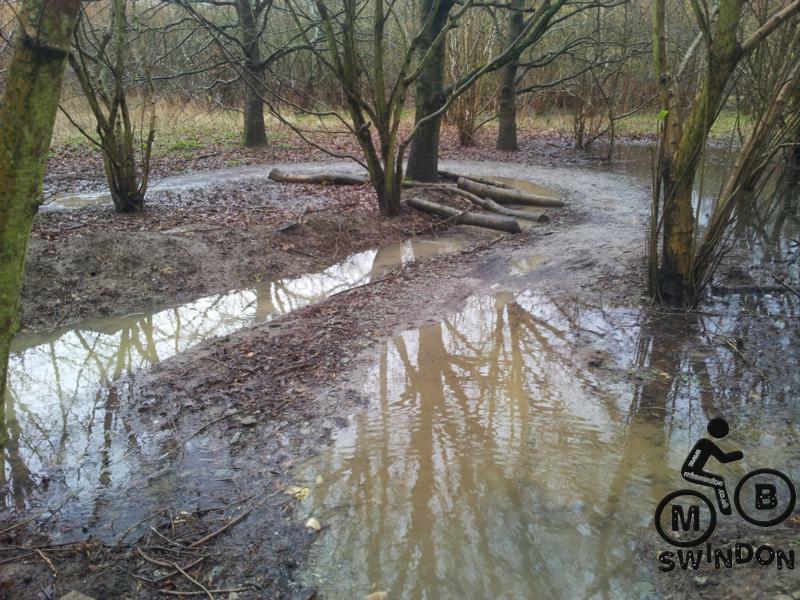 This area only flooded after several weeks of rain so we don’t expect this to be a serious problem. This was a bonus build session on the Saturday after Christmas. When I arrived at the special festive late start time of 11am then I found Phil Mayger, Phil Allum, Jez, Gary Palmer and Shaun Carolin standing in the rain raring to go. After the heavy rain then we found plenty of OCD (obsessive compulsive drainage) work. This consisted of digging channels to drain puddles. 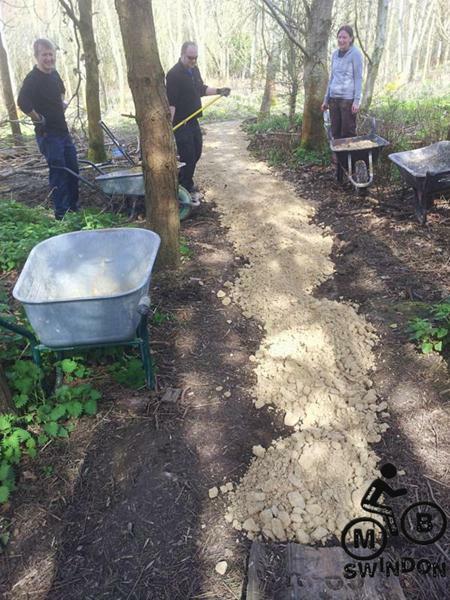 One group planted rocks on the second corner of the trail to stop corner cutting. 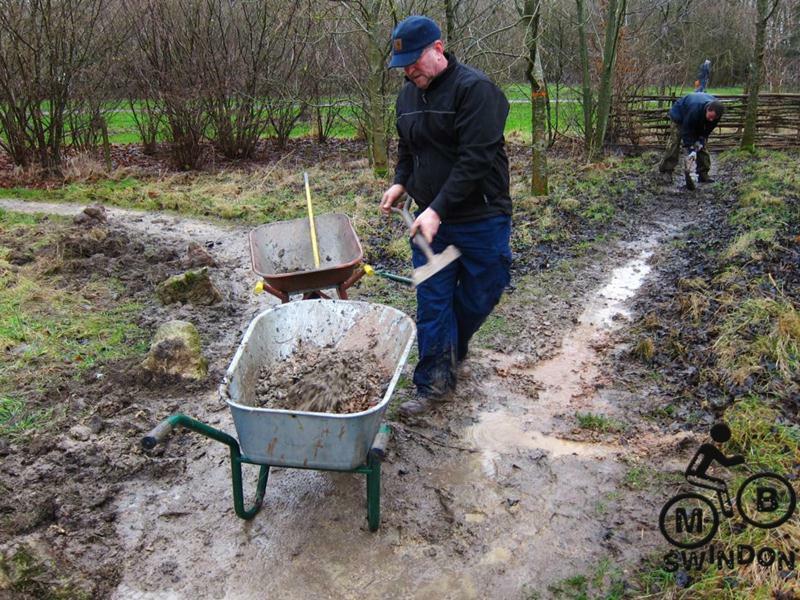 Whilst we were at it we decided to dig out the old start and fill that back in with mud (the new start was built in June 2009, resurfaced in Feb 2010 and the old entrance was closed off in Dec 2012). 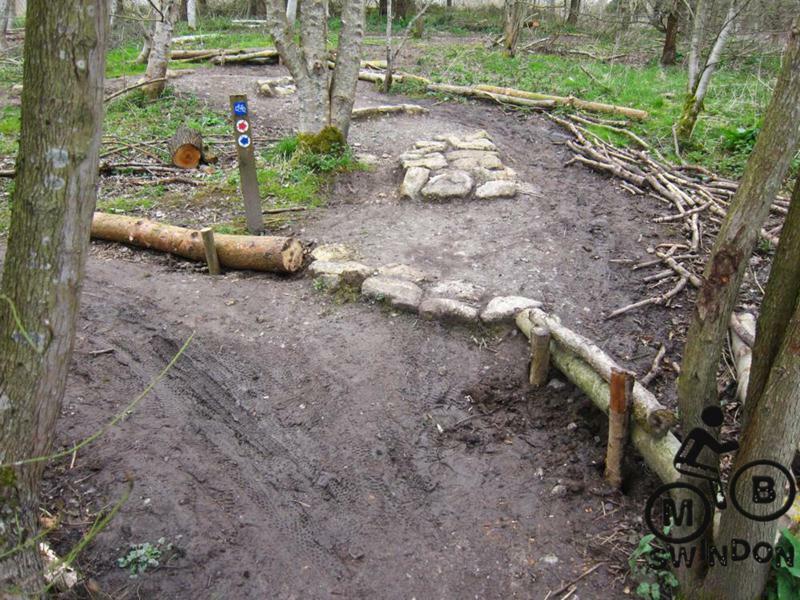 We’d resurfaced the follow on section in Feb 2012. 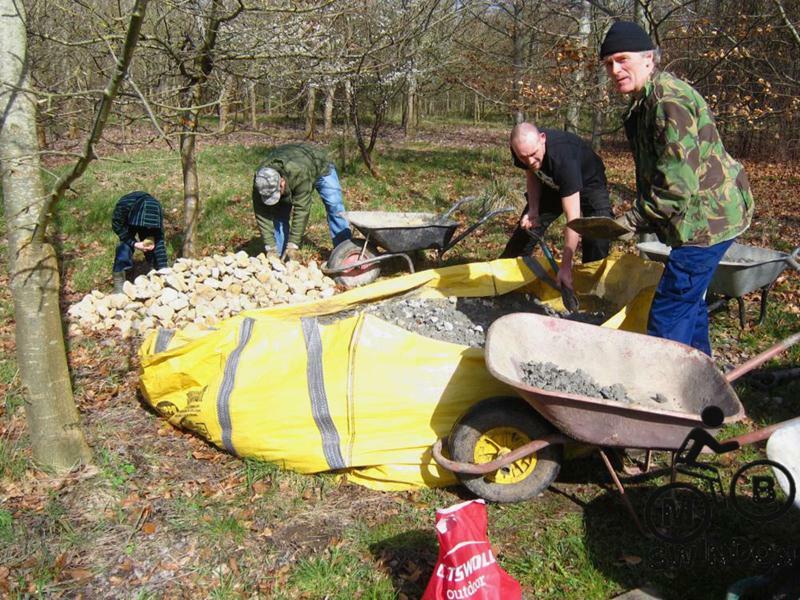 (We’d done similar rock placement in Sept 2010). Another group dug out the berm at the bottom of the steps on mway1 and planted a drainage pipe. 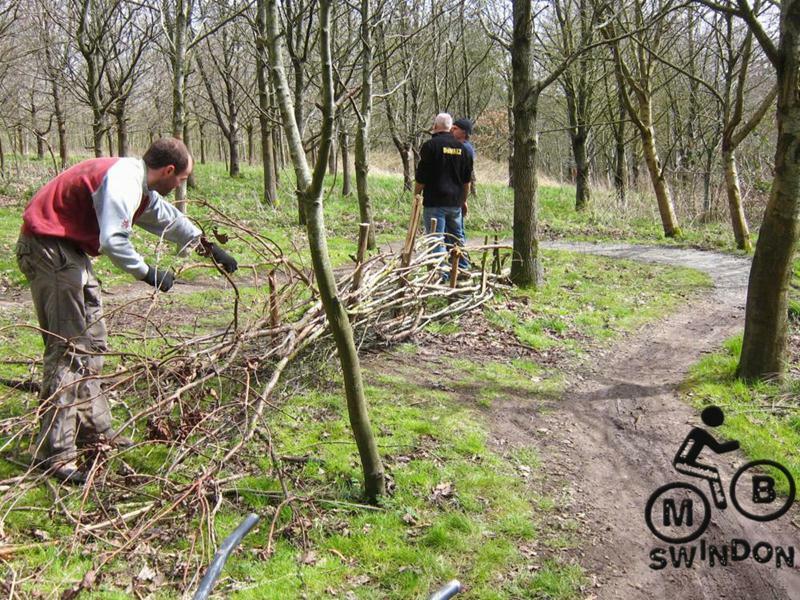 We’d already done this job in March 2011! The steps were build in July 2010. We were joined by Sarah Bailey, Jemma Oakes, Andy Matthews and Chris Hopkinson. 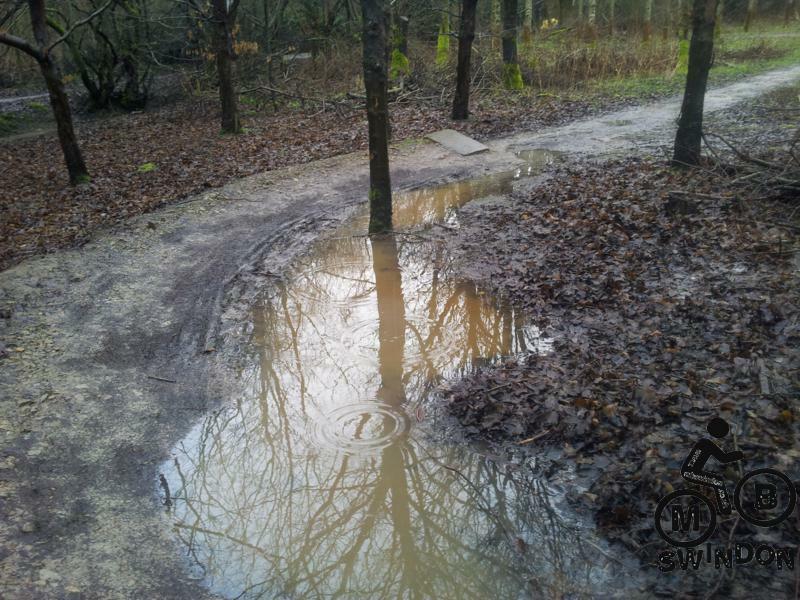 Another puddle area was fixed at the bottom of the descent on mway1. Whilst we were there we cleared some mud from the section. This had been built in July 2010 plus we’d done some other work in March 2012. With that all in the bag then we moved onto the big pond. 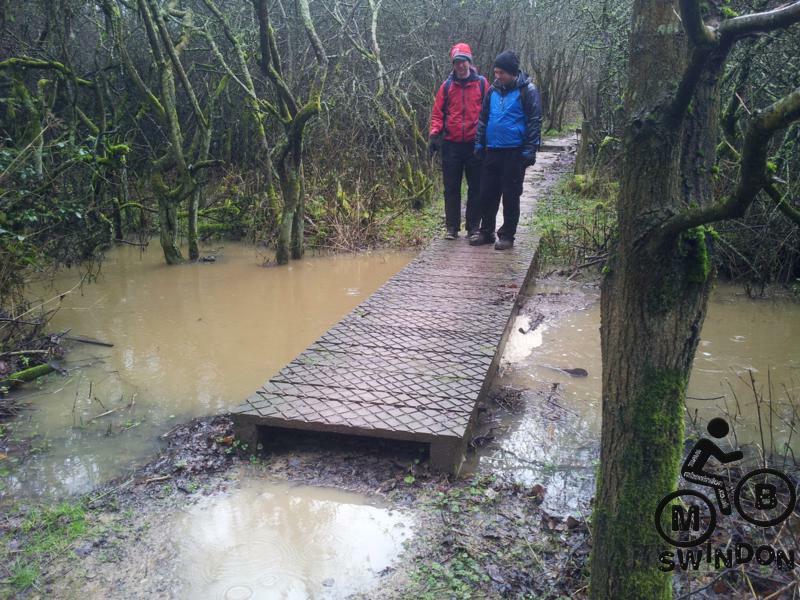 A whole section of trail had disappeared under several inches of water along with the surrounding land. This area had first been dug out in 2008 and finally surfaced in Dec 2011. 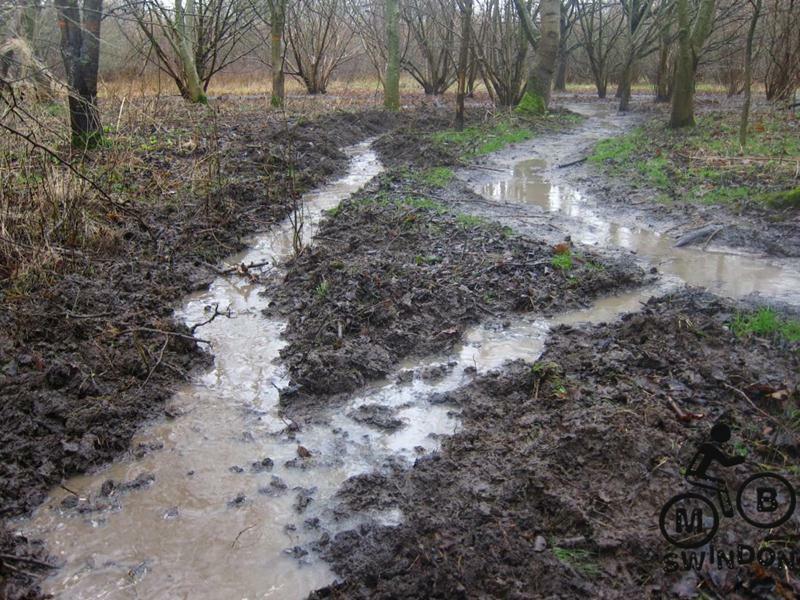 A drainage ditch was to start the process of draining the area. Hopes weren’t high because the whole area was flooded (we dug a bigger ditch in Jan 2013). 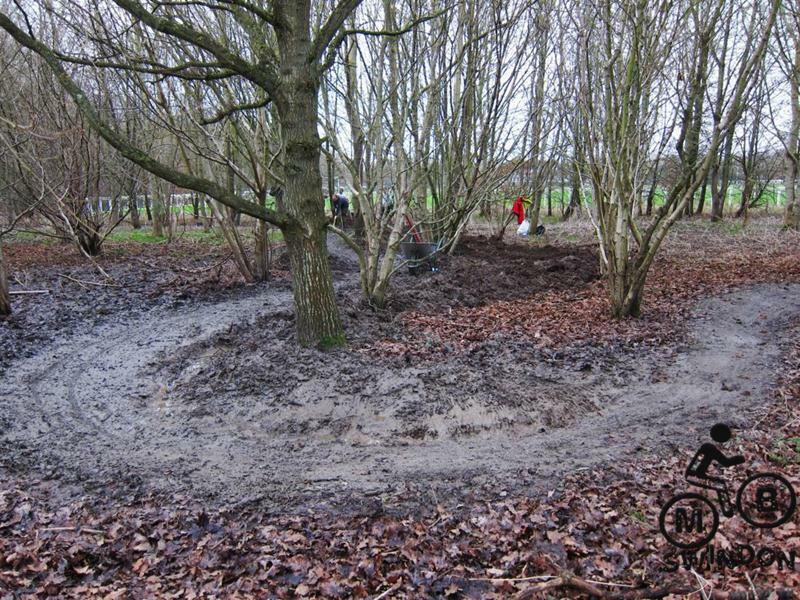 Finally the triangle exit area was drained and a bit of trail near the end of the triangle was cleared of gunk. 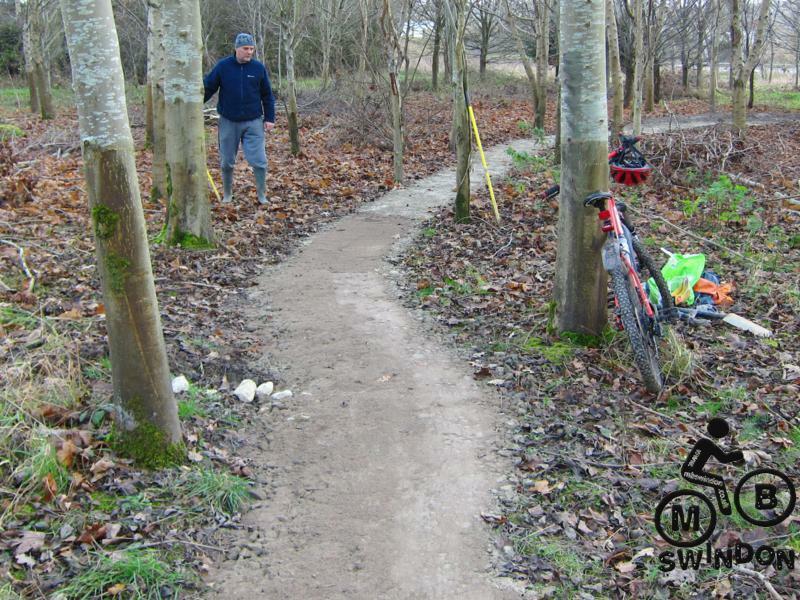 The triangle exit was dug out in May 2010, Aug 2010 and May 2011 and surfaced in Feb 2012 and a bit more added in Sept 2012. 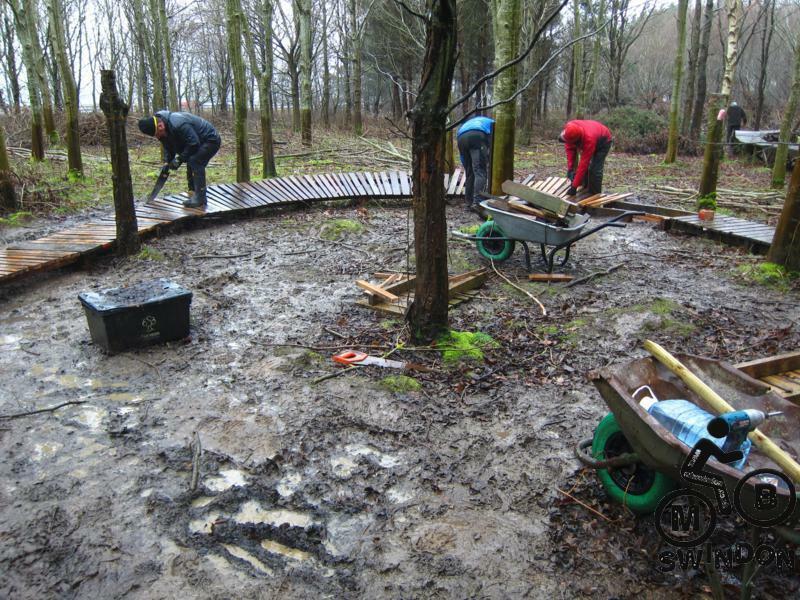 Big thanks to all those who came out in the rain and helped keep the trail up together. 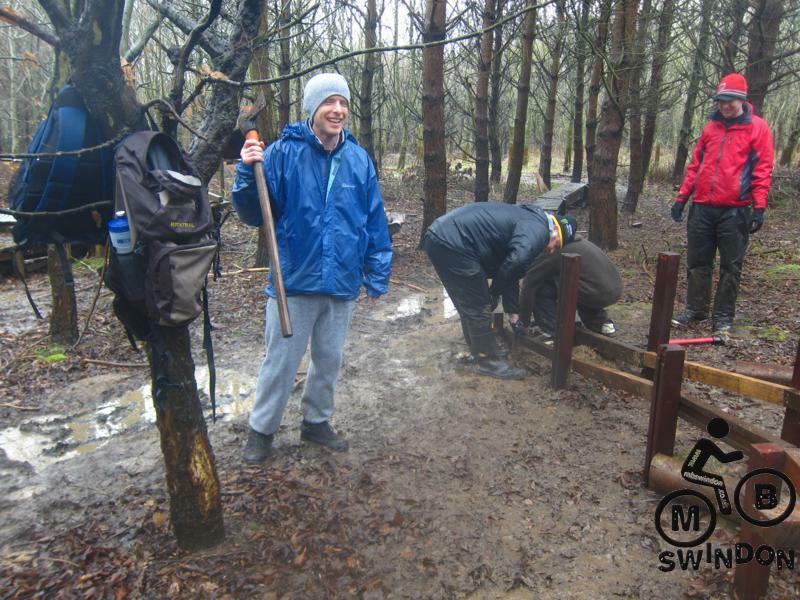 We made massive progress at the December build weekend (Saturday). 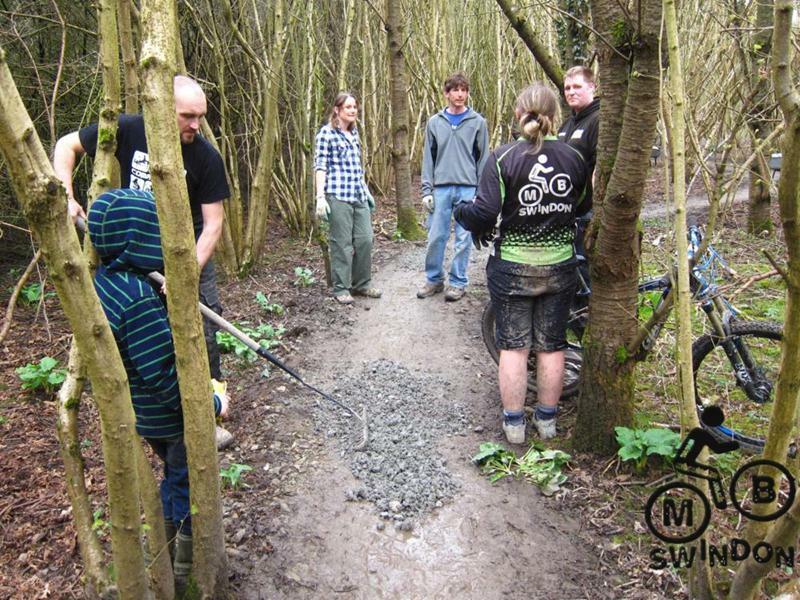 We want to meet up for a few hours and shift a load of material to fix a section of trail that’s sunk. We’ve got rocks and chippings nearby so the job should only take a few hours. 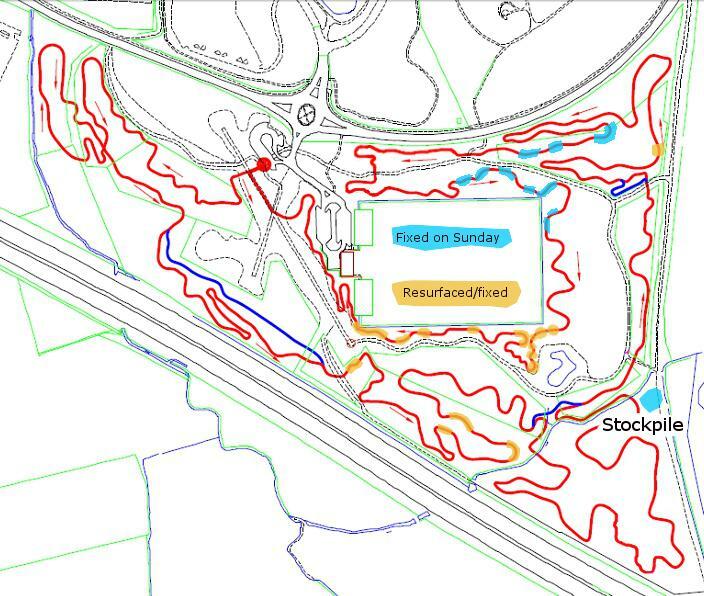 We’ll be meeting in the car park at 10:30am. Turn up any time you like – we’ll be in the triangle (bottom right of map below). If you've enjoyed riding Croft Trail then you can assist in its upkeep by making a donation, by joining the club and/or by coming on one of our build days. You can keep up-to-date by subscribing to our email newsletter, website updates, RSS feeds and social networking sites using the below. 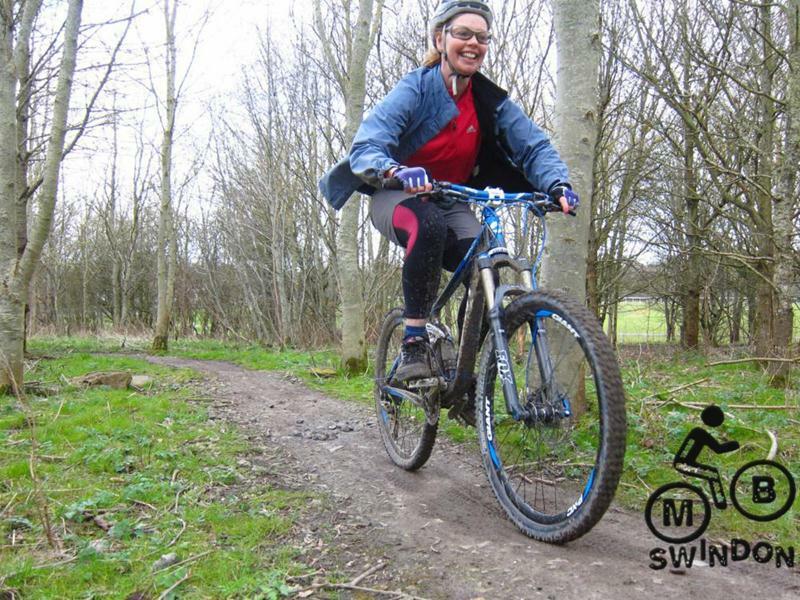 Remember that mountain biking is a risk-assumed sport so please take care, ensure your bike is properly maintained and wear appropriate safety clothing/helmet. Note that riding the Croft Trail or any other route mentioned on this site is done so at your own risk. 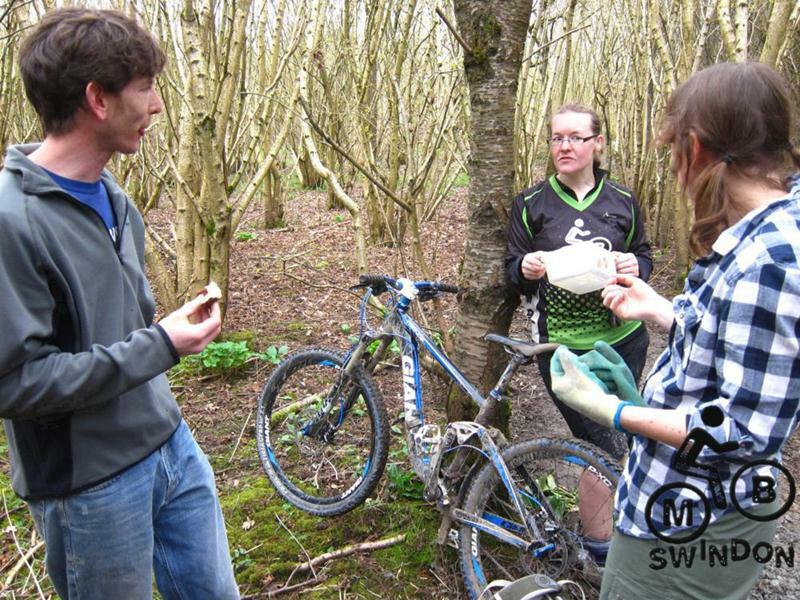 This includes attending rides listed in our events calendar which are, unless stated otherwise, arranged by volunteers not trained leaders. 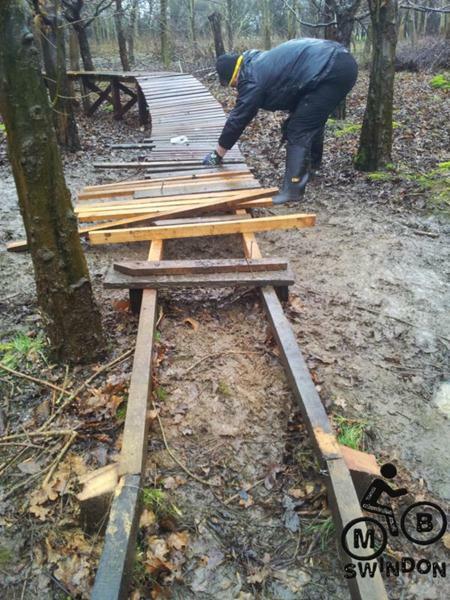 If in doubt about your abilities on a particular section get off and walk and consider getting professional training. Approval must be sought before reusing any pictures from this site.